We continue to help the UPV Talent. 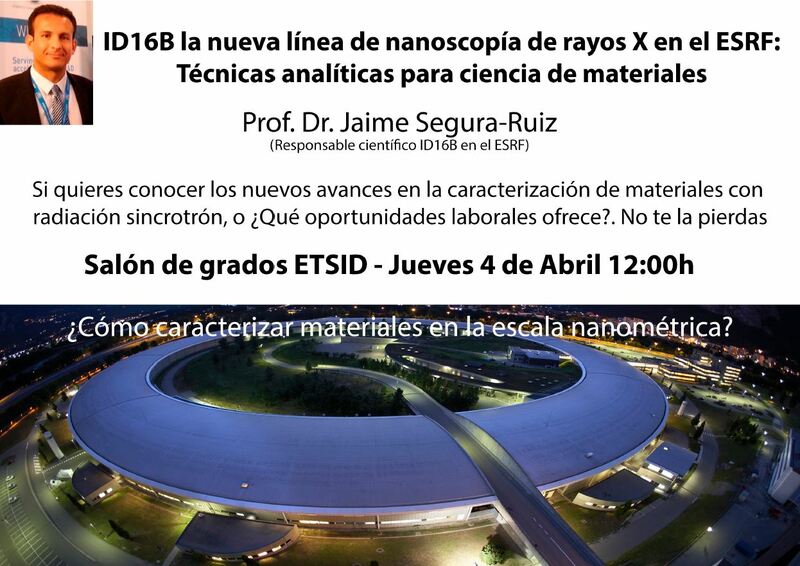 New appointment on May 16 at ETSID. Intended for students of Degree and Master of Design and students of other degrees with vocation and interest in design. 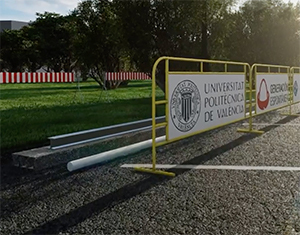 The Hyperloop team of the Universitat Politècnica de València will install in Cheste the test track to test their new subsonic train prototype. Once built, it will become the first lane of this type installed in Spain and one of the few in Europe. The team intends to carry out all the tests and validations for the Hyperloop Pod Competition IV. Hyperloop is an idea of ​​means of transport based on a system of large vacuum tubes, which circulate some capsules capable of transporting passengers and goods with speeds of more than 1,000 km / h. At the end of 2015, the visionary Elon Musk launched the Hyperloop Pod Competition and encouraged students from around the world to participate by proposing ideas. 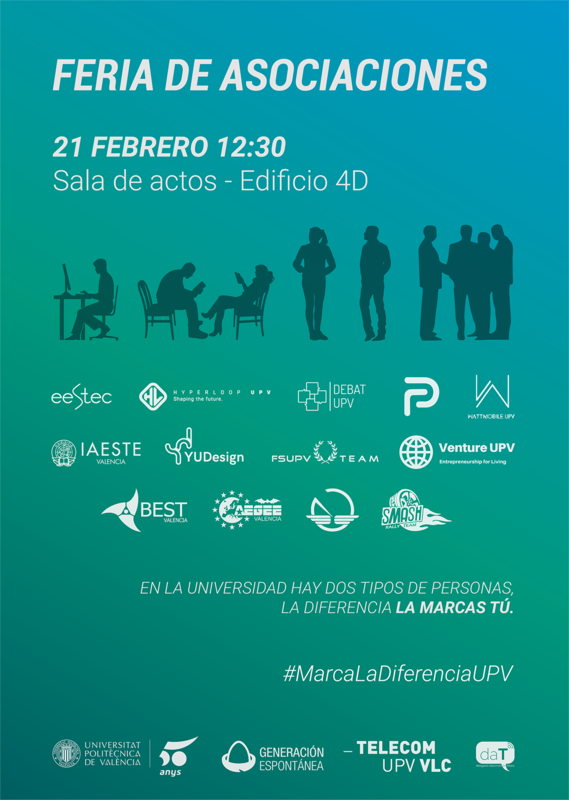 Since then, the competition has held three editions, in which the UPV team has established itself as one of the best in the world. The first Hyperloop test rail in Spain. Shortly, work will begin on the Ricardo Tormo Circuit, an area that has a capacity of 120,000 spectators and which hosts different scoring events of the Motorcycling World Championship. The length of the track will oscillate between 100 and 300 meters, which will allow the team to carry out studies on the suspension, navigation and levitation systems. It will be the first Hyperloop test track in our country and one of the few of this type that Europe currently has. The idea is to arrive ready for the competition that will take place in Los Angeles from July 15 to 21, 2019, and be able to fight for the victory. To achieve the test track that presents the best performance, the team has launched a microwdfunding campaign on Kickstarter. Thanks to this initiative, everyone can sponsor one meter of the road (or more), and leave their name inscribed in one of the most exciting transportation projects of the future. Although the team has exceeded the first objective, the campaign is still open until Thursday, April 25, 2019. If you want to help the 40 students who make Hyperloop UPV, do not hesitate. For reasons of improvement of the facilities and Easter time, the ETSID Library will be closed from April 19 to May 2. 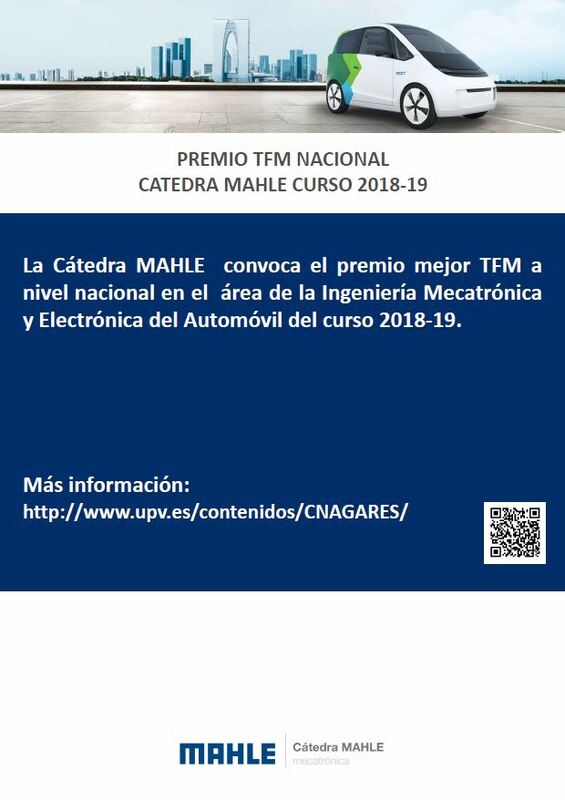 The Universitat Politècnica de València participates, representing Spain, in this European project approved in its call 2018 and which will last two years. – Allow students to get closer, get involved and value more the traditions and heritage of their region. – Asegurar que los jóvenes tengan el potencial, el conocimiento y las competencias para ser el cambio hacia la sostenibilidad que nuestro mundo necesita. – Ensure that young people have the potential, knowledge and skills to be the change towards sustainability that our world needs. – Initiate intercultural conversation and exchange among young people about cultural heritage, technological trends and circular economy. – Increase the set of learning opportunities for students, in order to develop their skills for their future work life. – Preserve heritage through the use of culture as a driving force for creative innovation, provide solutions to waste management problems, and take advantage of low-cost technologies to develop innovative ideas. – Develop the skills of teachers, to enable them to work with their students in “real” cases. – Strengthen the network of universities and higher education centers, fostering regional cooperation with stakeholders. – Create bridges between generations. Young people will better understand the older generation, sharing their knowledge and vice versa. The project takes into account the EU’s key priorities, while being consistent with the needs that partners experience in their daily practice. The project links regions with similar needs, but involves partners with specific experience in the three different themes: The Netherlands (as experts in circular economy), Spain (with experience in digital creation and manufacturing technologies) and Bulgaria (specialized in traditional crafts ). 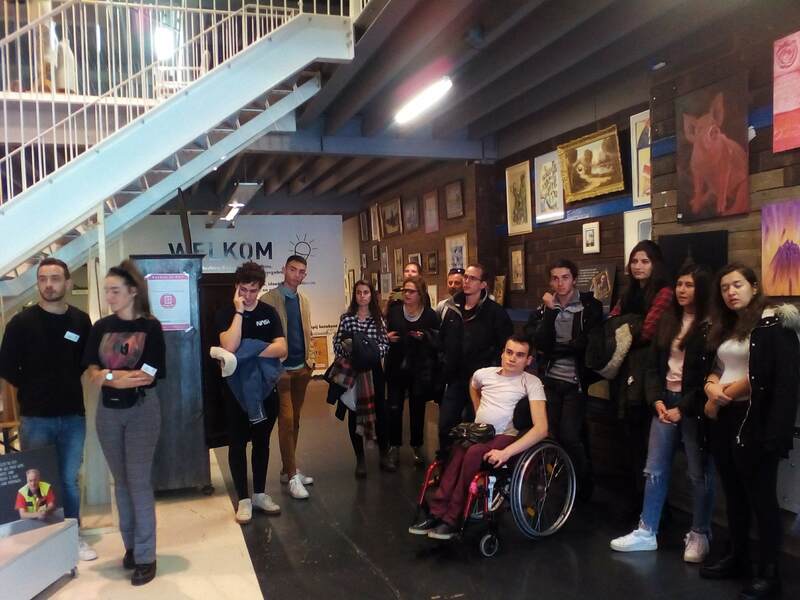 In addition, the aim is to initiate an intercultural dialogue among young people on cultural heritage, trends and new techniques and the circular economy, which specifically require a transnational approach. 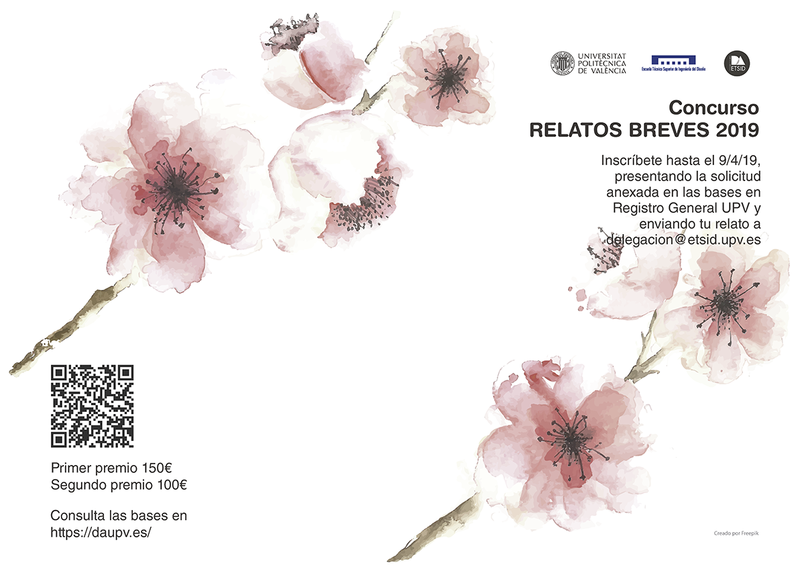 On April 4, an exhibition of the work developed among students and artisans from the regions of Frisland, Gabrovo and Comunidad Valenciana will also be inaugurated at the Craft Center of the Valencian Community, and on Friday, April 5, the meeting of partners will take place. the facilities of the Center, coinciding within the events that are celebrated by the European Craft Days. On April 10 and 11, the Employment and Entrepreneurship Forum of the UPV will be held. 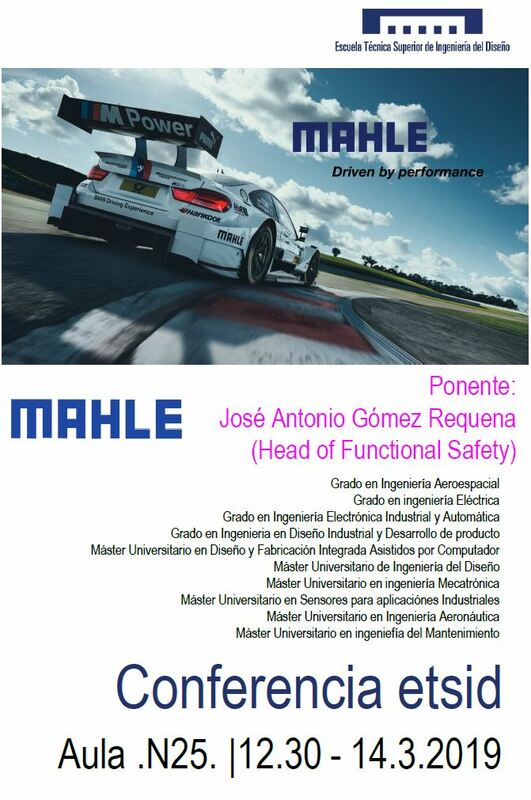 The MAHLE Chair announces the best TFM award at a national level in the area of ​​Mechatronics and Automobile Electronics Engineering for the 2018-19 academic year. Click on the images to download PDF. Click on the awards for more information. 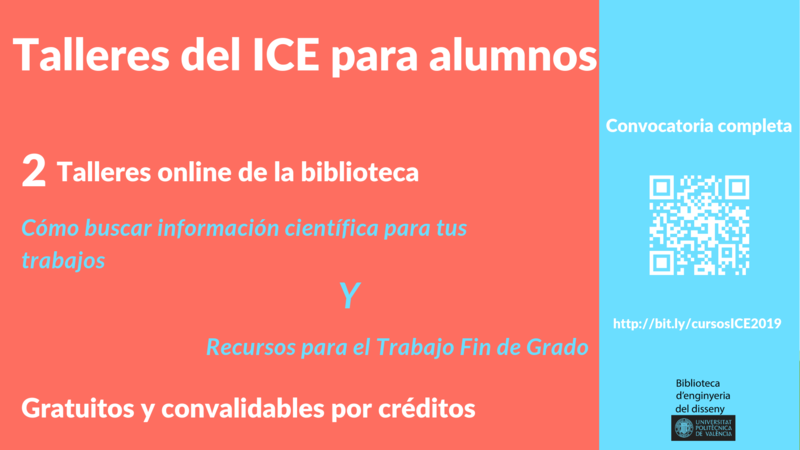 The Library offers two online workshops in the ICE offer: “How to search for scientific information for your work” and “Resources for the End of Degree Work”. They are free and validated by credits. Nazariy Harvat is a graduate in Aerospace Engineering specializing in Air Navigation currently working in Palma de Mallorca, on an airline called Thomas Cook Airlines Balearics. He finished the degree in July of 2017, the month in which he presented his Final Degree Project. 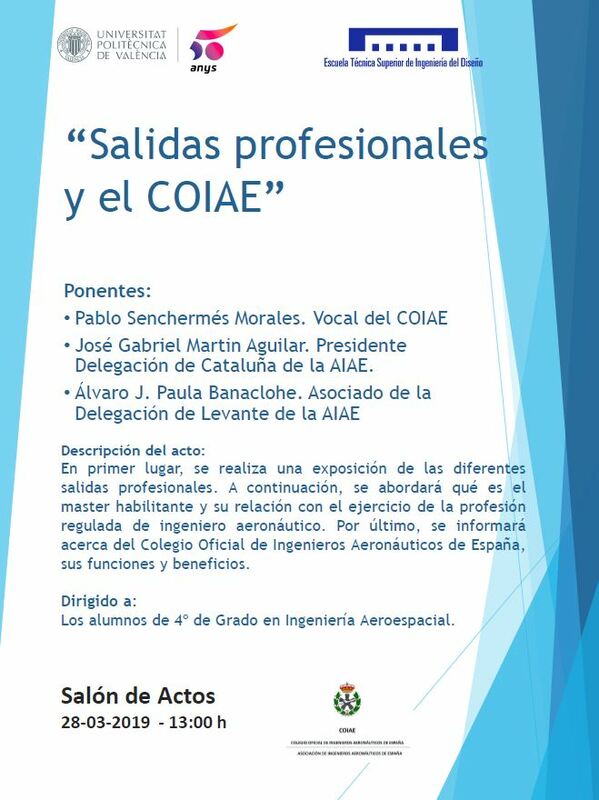 On March 15 he will explain to us at a general level how an airline or commercial operator works, that is, the regulations that it must follow, the structure of it, the functions of the different departments that compose it and the organizations with which it must collaborate to be able to carry out its tasks and achieve its objectives. Nazariy holds the post of Compliance Control Auditor, which is part of one of the departments of an airline. 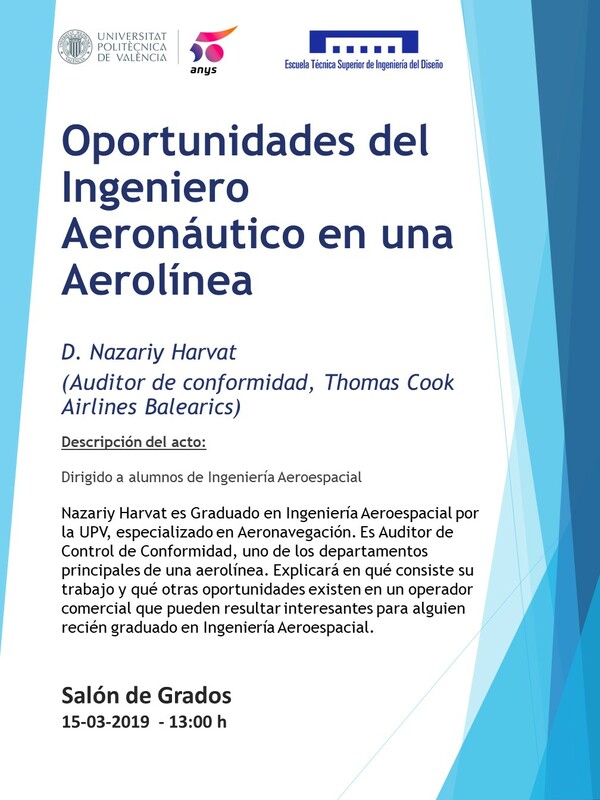 It will explain what your work is and what other opportunities exist in a commercial operator (or in an organization that usually works together with the commercial operator) that may be interesting for an aeronautical engineer. Finally, we will make a brief summary of his professional experience and will expose a series of conclusions that he has derived from it, in the form of advice that may be interesting and useful for someone recently graduated in Aerospace Engineering. 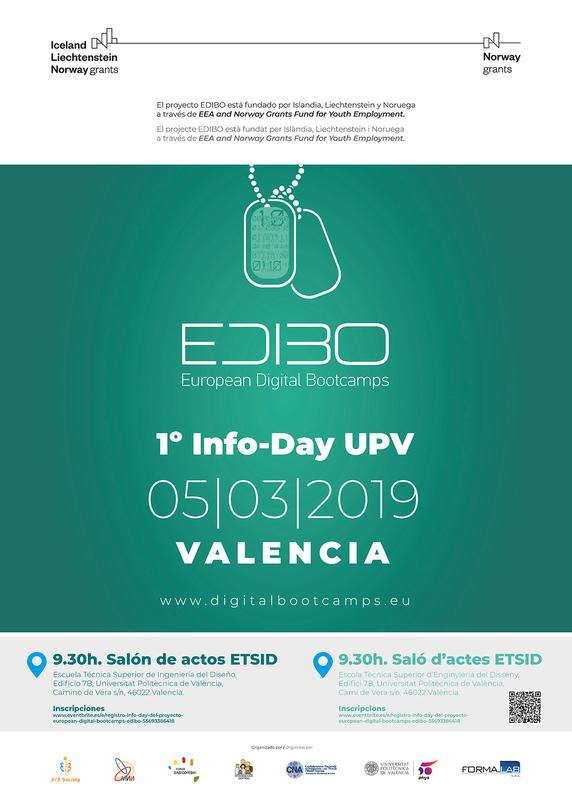 On March 5, the I Info-Day of the EDIBO Project (European Digital Bootcamps) took place at the School of Design Engineering of the Universitat Politècnica de València (UPV). The event was aimed at presenting the project to the university community, the business community and the general public. 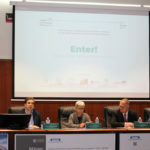 The event was opened by Ms. Rosa Puchades Pla, Vice-Chancellor of Social Responsibility and Cooperation of the UPV; Mr. Juan A. Monsoriu Serra, Director of the ETS of Design Engineering at the UPV; Mrs. Silvia Terrasa Barrena, Director of the ETS of Computer Engineering of the UPV; and D. Manuel Civera Salvador, Mayor of Llíria. All of them agreed on the importance of developing initiatives that provide solutions to youth unemployment and that, therefore, as highlighted by Ms. Rosa Puchades, are included in the commitments of the Agenda 2030 for Sustainable Development. Afterwards, the researcher responsible for the EDIBO project, D. Lenin G. Lemus Zúñiga, a researcher at the UPV, gave an overview of the problem in which the project is based on a set of data on youth unemployment in Spain and the business demand of experts in Information and Communication Technologies (ICT). Then the round table began on the theme “Knowledge and key competences to promote the labor insertion of young people in the ICT sector ” They participated in her D. Josep Enric García, manager of EMT Valencia; Mr. Ernesto del Valle Blanco, director of Human Resources and manager of the Alfatec ICT Training Center; Ms. Marga Aparicio Martínez from the Chamber of Commerce of Valencia; Mrs. Silvia Cuixeres Torres, Head of Purchasing Central Innovative and Sustainable Services of the Diputación de Valencia; Ms. Malak Kubessi Pérez, Head of the Orientation, Training and Employment Section of the UPV; and Ms. Begoña Sáiz Mauleón, researcher of the EDIBO Project and professor at the UPV. Mr. José Manuel Catalá Civera, director of the ITTAC institute of the UPV, moderated the interventions. The different contributions served to create a moment of shared reflection on the situation of young people at risk of social exclusion. In addition, each speaker presented the initiatives that their institutions or companies were carrying out to improve the employability of the youth sector as well as to respond to the demands of companies in the field of ICTs. A small debate was then generated in the that also attended the event. Among other aspects, the gap between university and business was addressed; and the need to strengthen ICT training to improve both the employability of young people and respond to the need for computerization of companies. 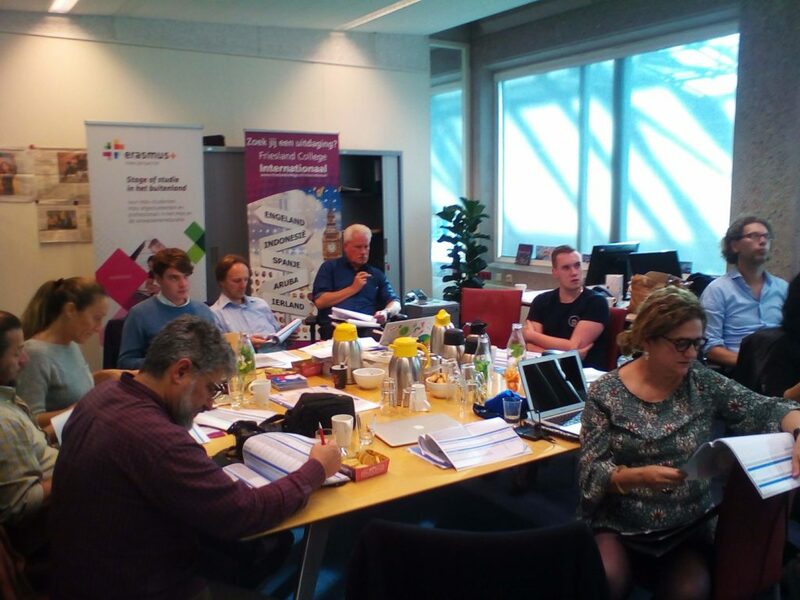 The EDIBO project is sponsored by the EEA and Norway Grants Fund for Youth Employment and in which the UPV participates along with institutions from five other European countries: Latvia, Lithuania, Bulgaria, Greece and Italy. The UPV group, led by Lenin G. Lemus Zúñiga, consists of 11 researchers from the UPV belonging to the ICT Group vs. Climate Change of the University Institute of Information and Communication Technologies (ITACA). 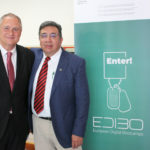 EDIBO is based on an innovative approach , inspired by the Rapid Technology Skills Training of the World Bank. At first, the set of collaborating companies defines their needs in ICT and training programs are developed from them. This training is offered to a group of young people between 25 and 29 years old at risk of social or labor exclusion, who are neither studying nor working. After the training period, the students carry out an internship in one of the collaborating companies, being able to obtain a labor contract at the end. 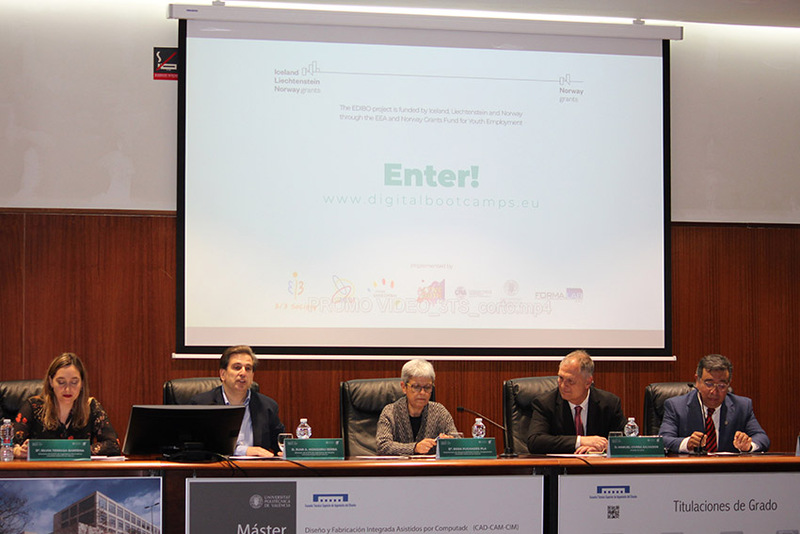 At the end of the 36 months of the project, in 2021, EDIBO will have involved 1050 young Europeans forming them in the ICT sector and reactivating their labor insertion capacities. 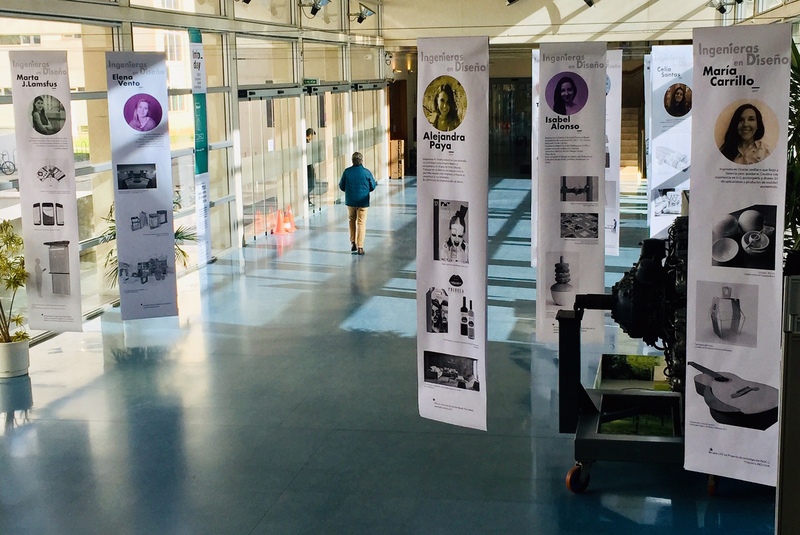 The ETSID welcomes in its hall the exhibition “Engineers + in Design”, that defines itself as “a pretext to talk about design from engineering and give visibility to the role of women in this professional profile”. The Agència Valenciana d’Avaluació i Prospectiva (AVAP) is an independent entity created with the aim of guaranteeing the quality and excellence of the Valencian systems of higher education, innovation and public services, through evaluation and foresight. 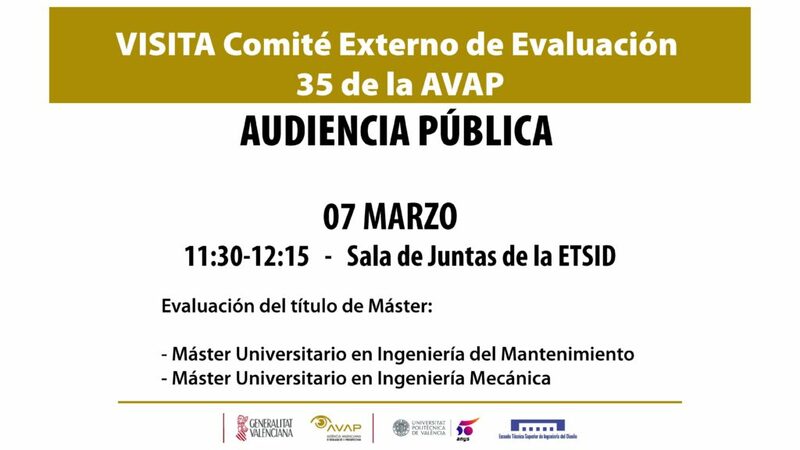 In its objective to achieve excellence, ETSID will receive the visit of the AVAP from Wednesday, March 6 to Thursday, March 7, 2019, for the evaluation of the Master’s degree in Maintenance Engineering and University Master’s Degree in Mechanical Engineering. Click on the image to download pdf. 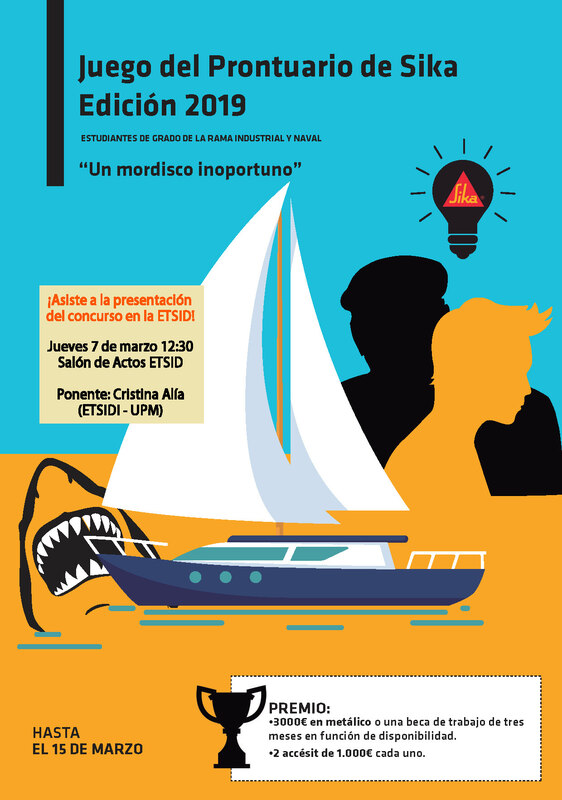 Next Thursday, March 7 at 12:30 in the ETSID Assembly Hall, there will be the presentation of the SIKA’s Prontuario Game, to which we recently encouraged you to participate. 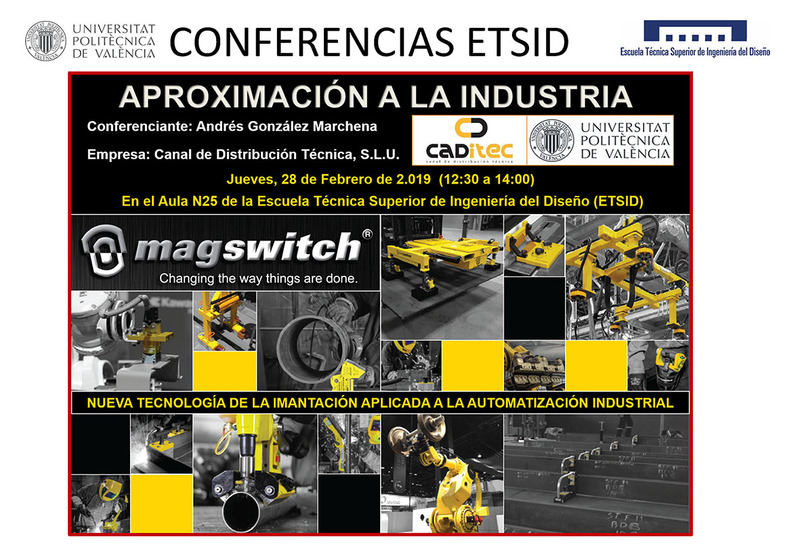 The presentation will be in charge of Cristina Alía, professor at ETSIDI (Universidad Politécnica de Madrid). We remind you that the prize includes: € 3000 in cash or a work grant of 3 months depending on availability. In addition, 2 runners-up prizes of € 1000 each will be distributed. 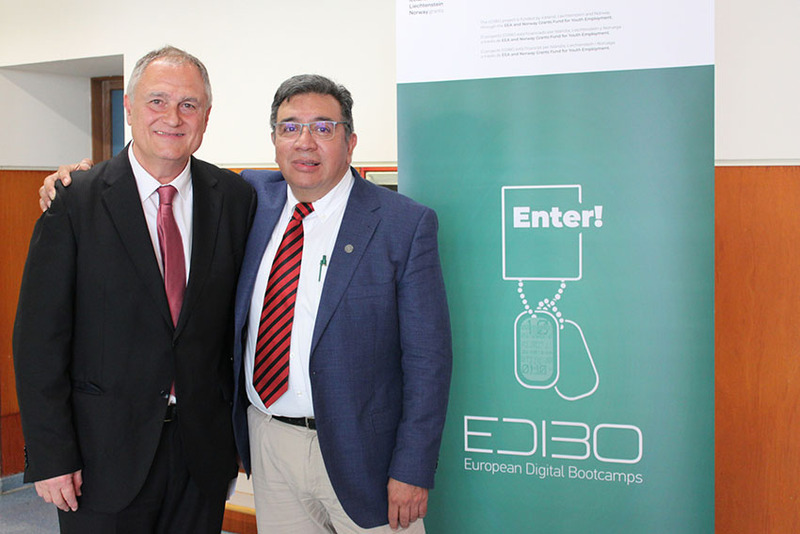 Next Tuesday, March 5, the European project EDIBO (European Digital Bootcamps) will be presented at our school. It is a project of social and labor inclusion for people who are, or could be, at risk of exclusion and whose age ranges between 18 and 29 years. This project is led by a multidisciplinary team of the UPV and this act Students, graduates, companies and university staff are invited. From the area of ​​Inclusion and Development Cooperation of ETSID we offer all the support to the EDIBO team, and we invite the staff and students of ETSID to take an interest in the project. We also request dissemination of the event to all those interested in the social commitment within the university framework. The Universitat Politècnica de València will be the only Spanish in the final phase. Of the 300 teams presented from around the world, only about twenty pass the cut. The team of more than forty students of the Universitat Politècnica de València has been classified, again, for the final phase of the Hyperloop Pod Competition IV, organized by the US company SpaceX, a benchmark in the aerospace field. The competition will take place in the city of Los Angeles next July 2019. 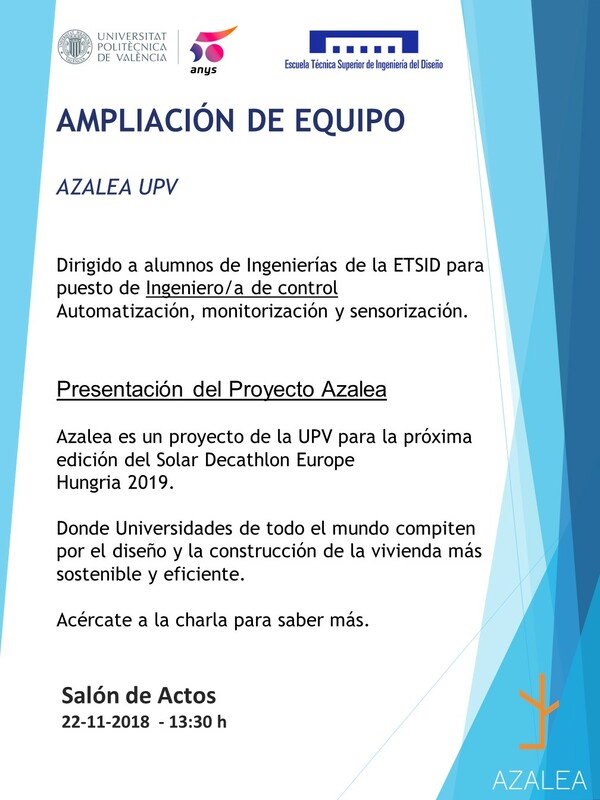 One more year, and there are four consecutive years, the UPV will be among the best teams in the world and will be able to present its fully functional prototype before the judges of the competition. Of the 300 aspirants from all over the world who have tried it on this occasion, only a score have managed to qualify for the final round. No other Spanish team has ever managed to overcome these first tests. And is that these initial phases are tremendously demanding and only two out of 30 proposals pass the cut. It is required to write an extensive document with all the technical details of what will be a posteriori prototype built and defend by videoconference the feasibility of the design. Hyperloop is an idea of ​​means of transport based on a system of large vacuum tubes, which circulate some capsules capable of transporting passengers and goods that reach speeds of more than 1,000 km / h in a completely sustainable way. The goal is to connect the most important cities in the world to make life easier for people. At the end of 2015, the visionary Elon Musk launched a university competition with his company SpaceX and encouraged students from all over the world to participate in the competition by proposing ideas. Since then, the Hyperloop Pod Competition has held three editions, which have served to develop innovative solutions, as well as recruit the best students. The UPV has not missed any of these competitions. 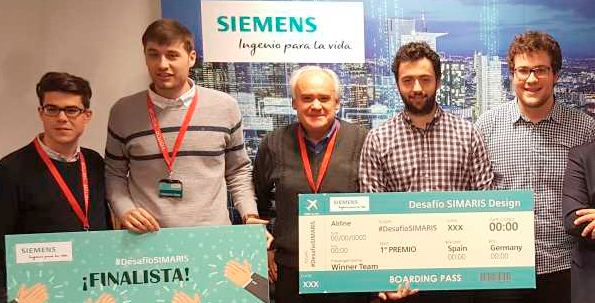 In the first edition, held in February 2016, the Valencian project was surprised to win the award for Best Conceptual Design and the Best Propulsion System. A year later, the team partnered with Purdue University (USA) and managed to be in the top 10 with its built prototype, the Atlantic II. 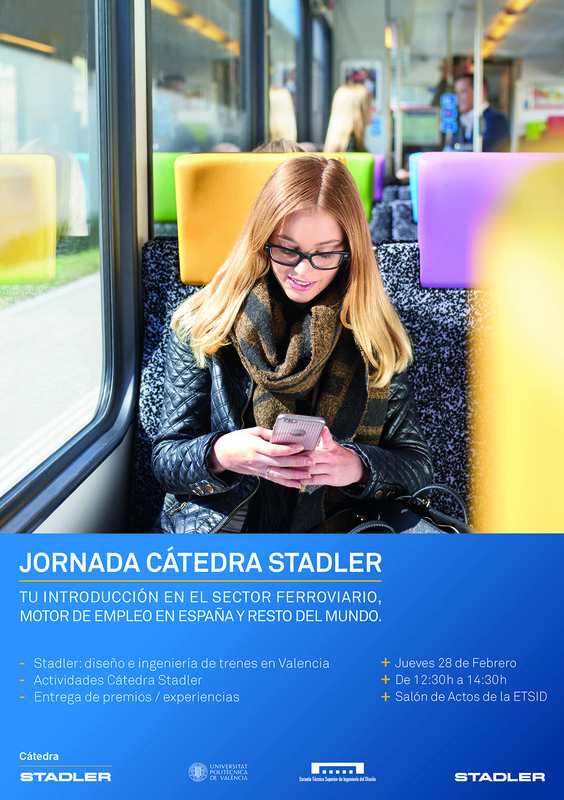 The following design, already totally Valencian, came to lead the competition in the summer of 2018. In fact, he managed to overcome a total of 50 tests and validations before suffering an electrical breakdown that prevented him from continuing. Finally, Valentia repeated his position in the list of winners, among the top 10, ahead of such prestigious universities as Berkeley or Michigan. Year after year, the requirement of SpaceX and the level of universities increase exponentially. In the opinion of the students who have participated in its editions, Hyperloop is one of the most complicated engineering competitions on the planet. Hyperloop UPV, consolidated as one of the best teams in the world, will finally seek victory in this new edition. The students are now working against the clock to realize their third prototype, which has been baptized as Turian. Hyperloop UPV remains committed to the goal of showing its Valencian origins throughout the world, so the name chosen refers to the river that crosses the city. Hyperloop UPV has the support of more than 50 companies and institutions that are firmly committed to innovation and university talent. However, the team is convinced that such a large project requires the maximum possible support, so it encourages more companies to get on this train and revolutionize the world of transport. José Puchau, associate professor of the Department of Mechanical and Materials Engineering of the Universitat Politècnica de València (DIMM-UPV), professor of the ETSID in the MUDFIAC master and engineering director of the KAMAX Group in his Museros plant, has been awarded with the Prize for the Best Personal Success Project at the KPI-Award Ceremony gala held at the Mercedes Benz Gallery in Berlin (Germany). Puchau, responsible for the creation of the Valencia Training Center in 2014, has accumulated 22 years dedicated to the training of professionals – more than 1,500 and more than 50 manuals and 400 operational videos. KAMAX is a multinational of production of fastening elements and complex cold forming parts with 12 sites around the world. With more than 3,500 employees, its turnover exceeds 750 million euros per year. Formative tasks of relevance that Puchau has led in the KAMAX offices in China, the Czech Republic, the United States and Germany. 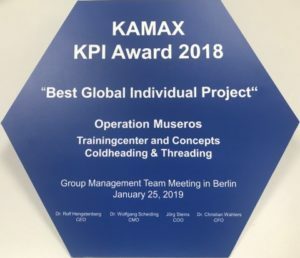 At the time of awarding the prize, KAMAX has also taken into account the implementation of the DUAL Training, which allows young Valencians to work in the United States, Germany and, as of this year, also in Mexico. We inform that the correct time of the conference will be at 3:00 p.m.
We attach the new poster. Sorry for the inconvenience caused by the error. This week we advance you in exclusive a very good news. After the videoconference with the SpaceX judges, we have just learned that the Hyperloop UPV team has once again been selected as a finalist for the Hyperloop Pod Competition IV, which will be held next summer in Los Angeles. With this, our team returns to become the only Spanish team and one of the few Europeans that manages to reach the final phase of the competition one more year. This news will be made official and will be transferred to the media throughout tomorrow. The team is fully motivated and ready to complete all the work done to date, trying to take our new prototype, Turian from the screen directly to the tube installed in the SpaceX facilities. Therefore, now more than ever, we will need all your support so that together we can fight to win the competition. Start the good. We keep working. A greeting from all the Hyperloop UPV team. The third edition of this competition is aimed at entrepreneurs and startups that seek to innovate in the construction sector. The call will be open until April 21 to participants from around the world. 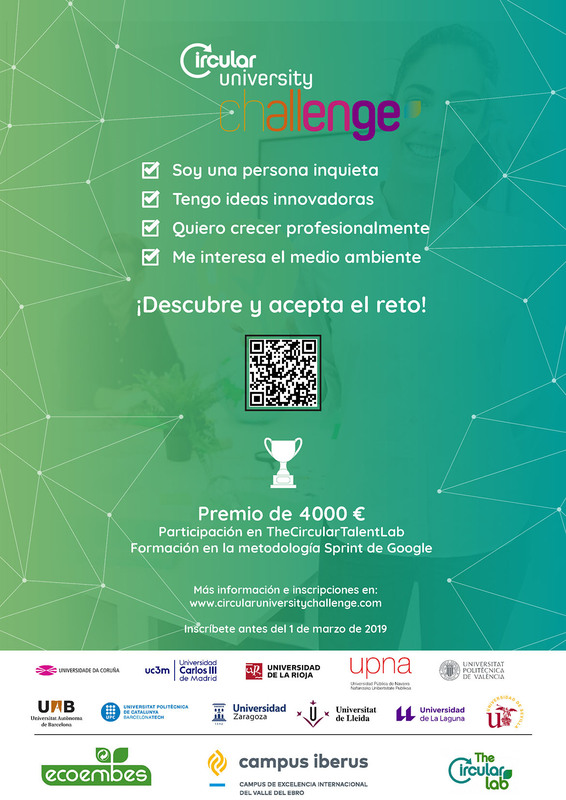 Madrid, February 22, 2019.– CEMEX Ventures announces the launch of the Construction Startup Competition 2019, to identify startups with the ambition to lead the transformation of the construction industry. Under the slogan Apply. Grow. Make your mark, CEMEX Ventures, the Corporate Risk Capital of CEMEX, presents its third call, open until April 21, 2019. It challenges entrepreneurs and startups to set their brand in the construction ecosystem, to grow and position your solution in the industry. The winners will be evaluated for their relationship with six areas of opportunity ranging from intelligent buildings and cities, to the optimization of supply chain management, through construction with innovative materials and construction methods or optimization of productivity, efficiency and quality in the daily management of the works in work, among others. Those interested in participating can register through the website of CEMEX Ventures. Once all the proposals have been evaluated, the winning startups will be invited to Monterrey (Mexico) on July 18, where they will present their projects to an audience made up of the world’s leaders in innovation, investment and construction. This will only be the beginning of the offer that the CEMEX venture capital area will offer to the winners. In addition to the springboard to new investors and companies focused on innovation, CEMEX Ventures will work with the startups that best fit their needs. Up to now there are more than four startups that, taken from the previous two CEMEX Ventures competitions, enjoy their offer. Ipsum and Prysmex, finalists of the first competition in 2017, are part of the investment portfolio and continue an eminent process of expansion to new geographies. Some 2018 Construction Startup Competition finalists continue to work closely with CEMEX, opening markets in new countries, piloting their technology and exploring investment possibilities. CEMEX Ventures was born in 2017 and focuses its activity on helping to solve the main challenges and areas of opportunity that the construction ecosystem has through sustainable solutions. CEMEX Ventures has created an open and collaborative platform to lead the construction industry revolution involving startups, entrepreneurs, universities and other relevant stakeholders to address the most difficult challenges in the industry and shape the value ecosystem of tomorrow. The Agència Valenciana d’Avaluació i Prospectiva (AVAP) is an independent entity created with the aim of guaranteeing the quality and excellence of the Valencian systems of higher education, innovation and public services, through evaluation and foresight. In its objective of achieving excellence, ETSID will receive a visit from AVAP from Thursday, February 28 to Friday, March 1, 2019, for the evaluation of the Master’s degree in Computer-aided Design and Integrated Manufacturing and University Master’s Degree in Design Engineering. Fresh Product 2019. Design center Matadero, Madrid. 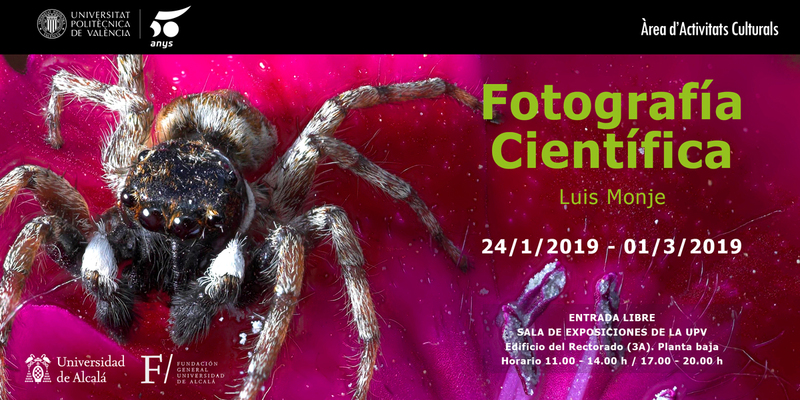 Exhibition from 05 February to 20 March, 2019. 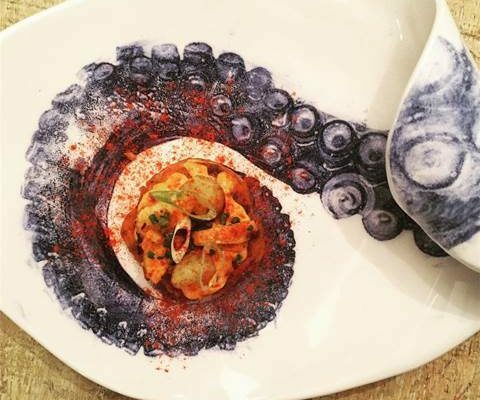 Cobaltopus, is the result of an order from the chef Chema Soler of Restaurante la Gastro (Madrid). The creative team formed by our colleague Chele Esteve, professor of ETSID (UPV), Ricardo Moreno, professor of EASD Valencia, Eugenia Boscá, ceramist and Jose Plà, artist who worked together co-designing and sharing all their experience. If in China gardens are designed by architects, colors are selected from their palette by painters and by poets, in this case something similar happens. It is an example of participatory or cooperative design where each actor contributes his intimate knowledge. “We met at La Gastro in Madrid, in October of last year and we tasted the octopus tapa, surprising in textures, taste, visual … All the senses were opened to us and from this moment the pencils began to smoke”, point out these creative. This set of 8 different pieces in size and shape, has plates and trays designed exprofeso for the XIV National Contest of Pinchos and Tapas City of Valladolid (2018), unique in Spain with representation of all the autonomous communities. 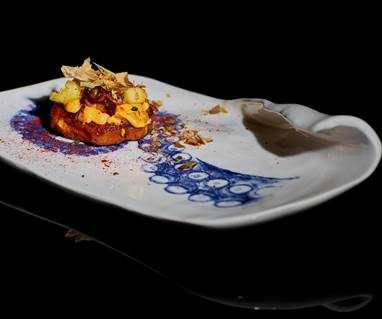 The tapa “Okonomiyaki from octopus to Galician”, is made with octopus as the main raw material in fusion with Japanese products. 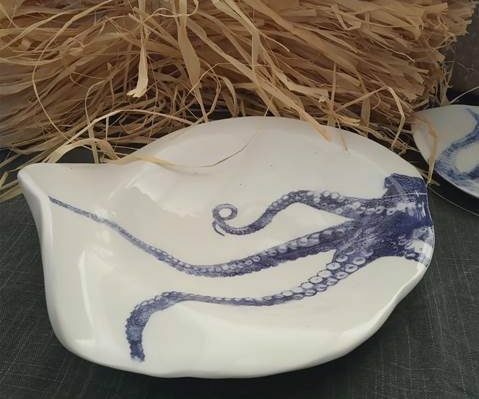 According to the creators of Cobaltopus: “We wanted to reflect the gastronomic, cultural and marine influences where the Mediterranean Sea, the Atlantic Ocean and the Sea of ​​Japan congregate with the octopus as the main element. 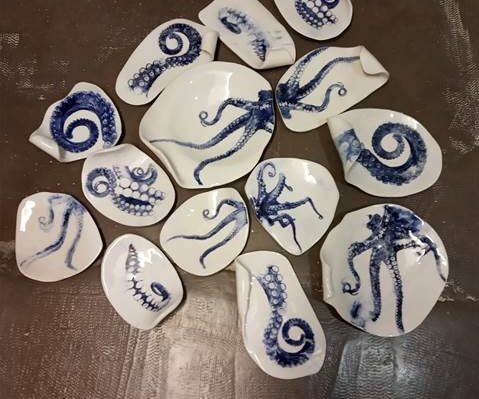 The cobalt blue transports us to trace a journey through the seas that bathe the Iberian peninsula until we reach the Japanese domains erasing the sea leagues that separated us by the blue color in the glaze processes of ceramics “. To materialize the design, the technique of transfers in plates and trays is used. 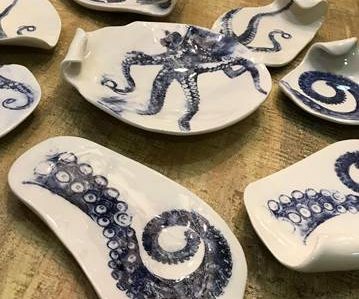 Made by hand with plates of different shapes that create a visual set that takes us into an oniric universe of flavors. Transferring the image on ceramics is a sophisticated procedure where cobalt oxide must be well impregnated in the ink on the earthenware. This results in a visual effect as a result that is visible in the second firing once the enamel is applied. If in the words of Marco Tulio Cicero (106 BC – 43 BC): “The pleasure of banquets should be measured not by the abundance of delicacies, but by the gathering of friends and by their conversation”, you could add the importance of the content and the continent, hence the collaborations between cooking, design, crafts and art mariden to obtain complementary results that invite the diner to live the slow culture. 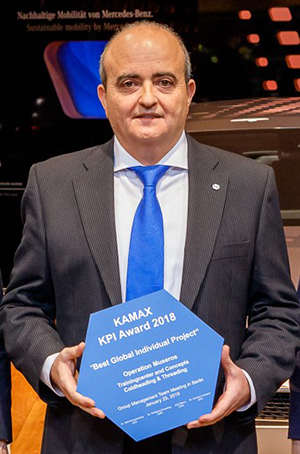 José Puchau Gadea receives the award for the best personal success project in the “KAMAX KPI-Award Ceremony” held on January 25, 2019 at the “Mercedes Benz Gallery” in Berlin. 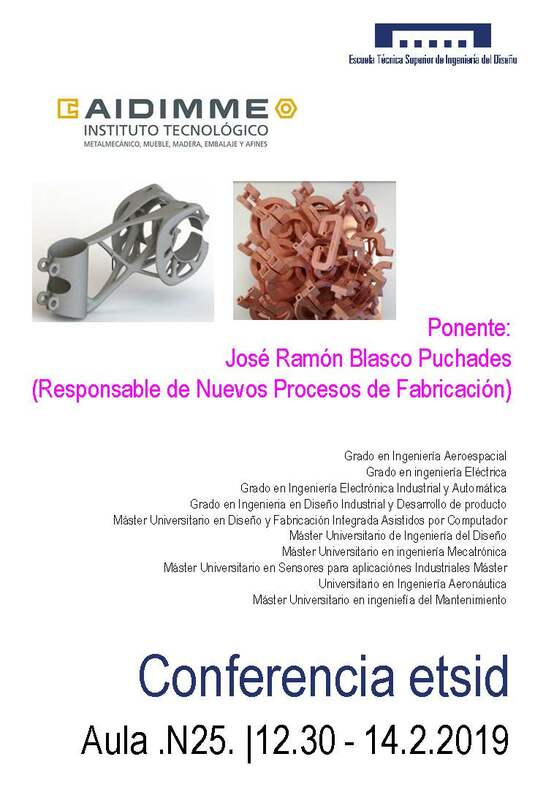 José Puchau is an associate professor at the UPV and teaches at the Master’s Degree in Design and Integrated Computer-Assisted Manufacturing (MUDFIAC) of ETSID. 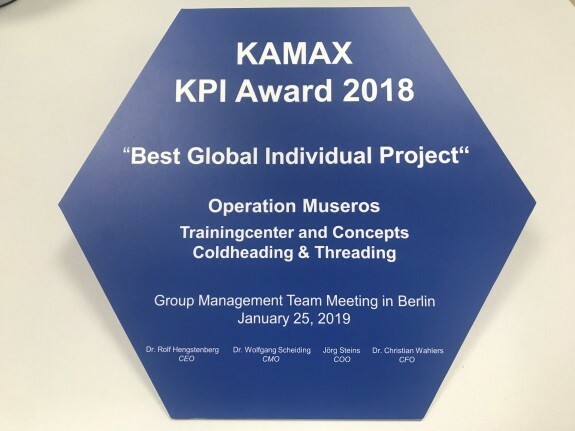 The aforementioned award has been granted for his global training project in which the creation of the “Training Center” stands out in the production plant that the KAMAX company has in Museros, where José Puchau is the Director of Engineering and has led training projects during the last 22 years. 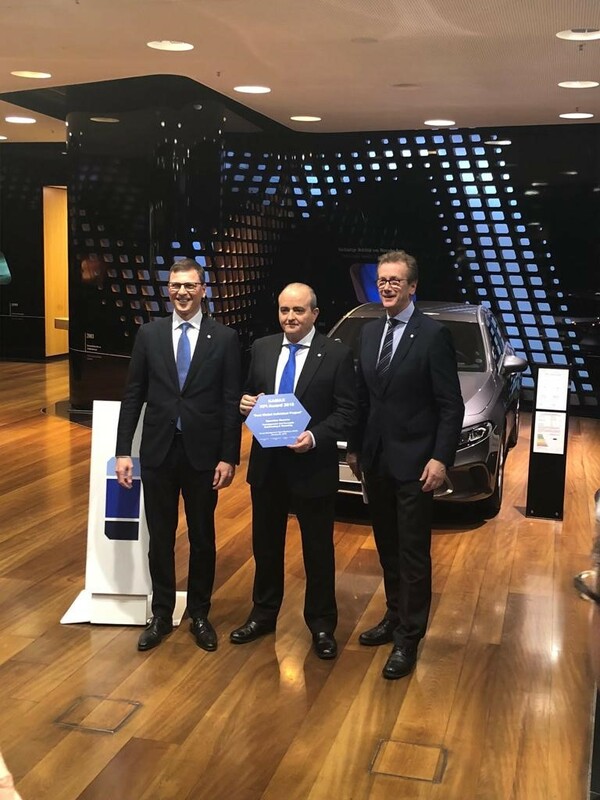 The awards were presented by KAMAX on 25-01-2019 at the “Mercedes Benz Gallery” in Berlin, which is called in KAMAX “KPI-Award Ceremony”, because it refers to the indicators of the Company. Once a year, the GMT (General Management Team Meeting) is held, which includes the awards ceremony. The prizes are worldwide, that is, they compete for all the KAMAX Group plants, located in Germany, Spain, China, the Czech Republic, Slovakia, USA and now also in Mexico. Prize for the best plant. Prize for the plant that has most developed during the last year. Award to the best personal project of success. The prize for the best personal project is the one that has been awarded to José Puchau this year. This project deals with training at the global level, especially for production operators. 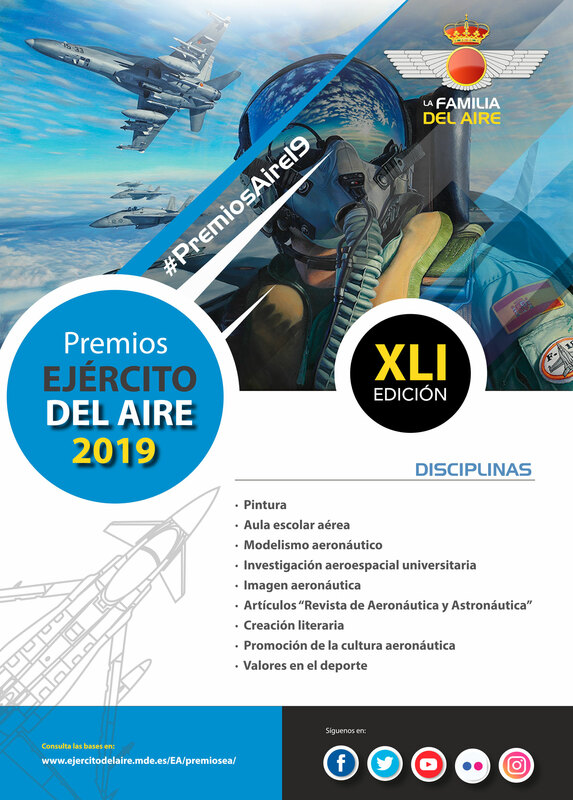 Of course, the creation in 2014 of the Museros Training Center, which has been a key point for the achievement of this award, has influenced this. More than 400 operative videos for training. 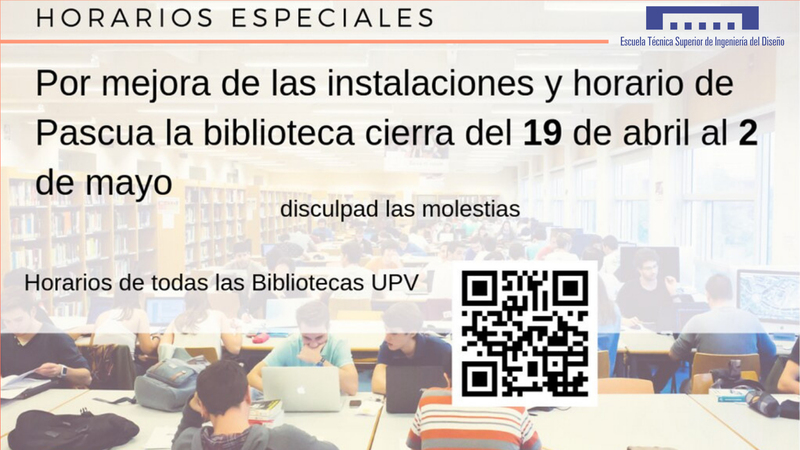 On the occasion of the selective process of Technical Specialists of Library in the UPV, this Friday 22nd, The opening hours of the ETSID Library will be from 8:00 a.m. to 3:00 p.m.
Internships for students of the Degree in Aerospace and the Master of Aeronautics. We inform you that the registration to the 27th University Congress of Educational Innovation in the Technical Teachings (27 CUIEET) is now available. All the information about it can be found on the congress website: www.27cuieet.es. We hope that the celebration of this new edition will contribute to maintaining the quality of this university congress, and we encourage you to participate in this 27 CUIEET. Soon the link to the web of the same that we are building, where you can have more information about it and the links for registration and sending documents. We are waiting for you in June in Alcoy. We will wait for you!!!! If you are an undergraduate student, you can make your SICUE application to complete an exchange period at another Spanish university. The deadline ends on March 13 at 11:59 p.m. Do not wait until the last day !! We encourage you to participate in the draw organized by EF Education First in which you can win a 1-week trip to Malta. The prize includes: flights, accommodation and full board, a week of English classes and creation and project management classes. With departure on Sunday, April 21 and return on Saturday, April 27. 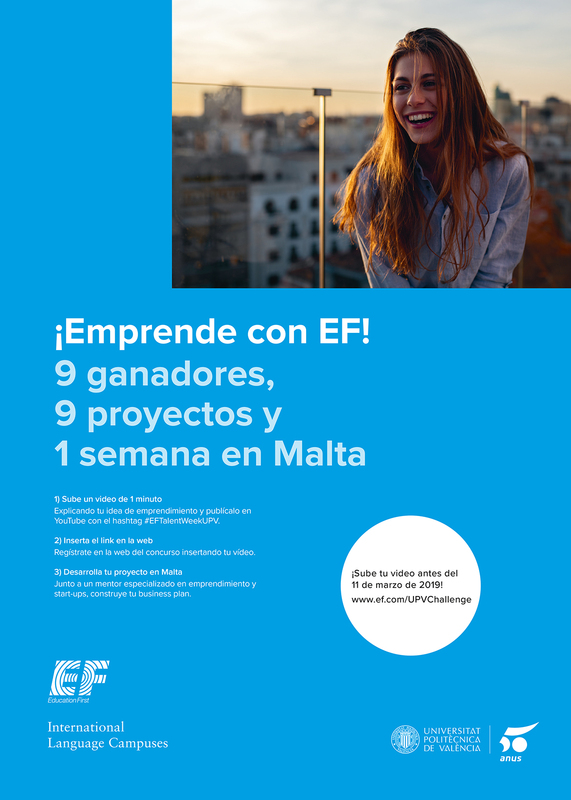 2) Increase your chances of being chosen by uploading a 1 minute video to Youtube explaining your business idea with the hashtag #EFTalentWeekUPV (if you do not upload it, you can also be chosen). 3) Develop your project in Malta with a specialized mentor and build your business plan. Do not hesitate! You have time until March 11, 2019. 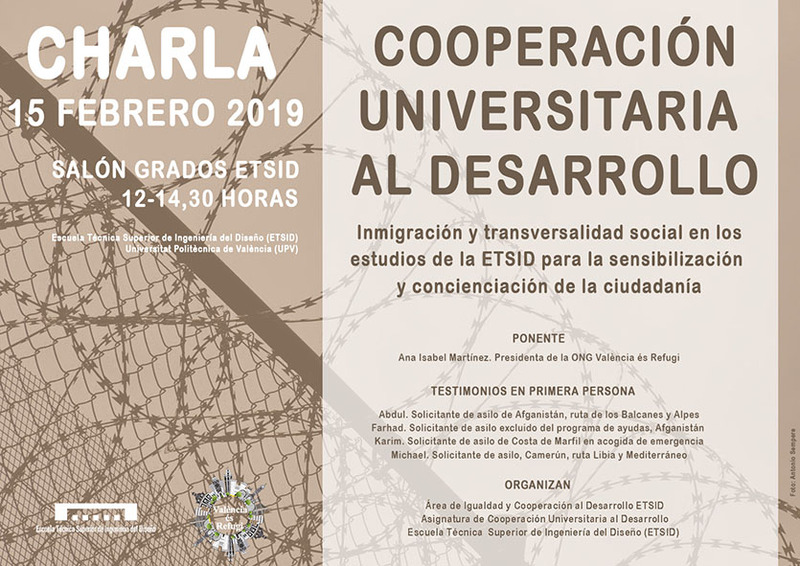 The Inclusion and Development Cooperation Area of ​​ETSID invites the students and faculty of the School to the talk “Immigration and social transversality in the studies of ETSID for awareness and awareness of citizenship”, given by ONG València és Refugi, on Friday, February 15 at 12.00, in the Graduate Hall of the Higher Technical School of Design Engineering (ETSID). 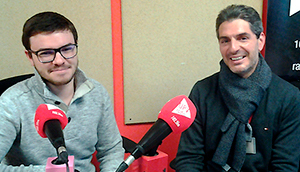 UPV Radio, the official transmitter of the Universitat Politècnica de València (UPV), commemorates today the World Radio Day with the premiere, at 11 am, of Polifacètica , its new program aimed at the university community. Polifacètica includes several sections, such as “Hui preguntate jo”, where students interview teachers who have marked their university education; “I’ve been talking about the free book,” which allows authors and authors to present their publications; “Naturalment”, in which the environment will be discussed; or “In Form”, section dedicated to university sports results. Weekly and one hour in length, Polifacètica will be broadcast every Wednesday, from 11 a.m. to 12 p.m., live, through the 102.5 FM, with replay on Thursdays starting at 6.30 p.m. In addition, it can also be heard via podcast , at any time. This new space of UPV Radio was created with the aim of bringing the radio to all sectors of the university community: students, faculty and administration and services personnel. 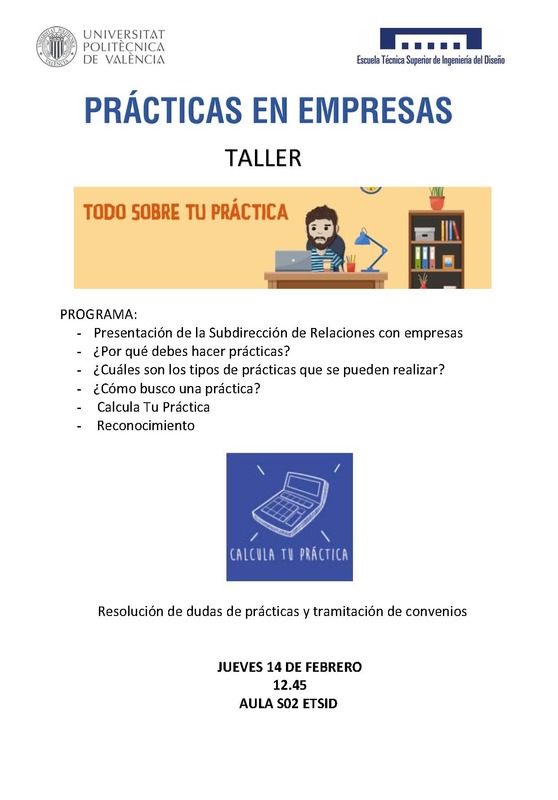 For any suggestion, proposal or interview that you wish to carry out, do not hesitate to contact us through polifacetica-rtv@upv.es or by sending us an audio of whatsapp to 673.935.836. A whole life dedicated to teaching is what defines Enrique Ballester Sarrias. 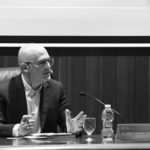 For 32 years, from 1986 to 2018, he has been at the head of the School of Design Engineering of Valencia. Doctor in physical sciences and professor of the ETSID (Department of Systems Engineering and Automation), at the end of last year he left his position as director, after a prolific career, which had begun in 1961, in the company Hidrocivil. Of all his career as a professor and director of ETSID, what are you most satisfied with? To start with other colleagues the internships in the company, the international relations and the improvement of the facilities that have allowed to incorporate new teaching methodologies with changes in the academic results of the students. As director, introduce the philosophy of the accreditation of our studies, which has allowed us to have the seals of excellence, EURACE, in our titles, as well as ABET and Pegasus, which, in turn, has contributed to achieve up to six Awards Nationals of the seven that our university received in a year. What aspects of the University require more urgent solutions? Change all the legislation that in the Rajoy mandates have blocked the Spanish public university. From the reduction of budget, the limitation of personnel (remember that for every 10 that retired could take a place), the rate increase, the changes of criteria in the allocation of scholarships to the drastic reduction or suppression of investment in research . Why is innovation so necessary for a country? We must change education from the first steps, develop teaching models that promote the realization and presentation of prototypes and other works at all levels, especially in the university. We must introduce entrepreneurship and innovation as something substantial in university education, the more our students are able to be entrepreneurs and innovate in their jobs, the better they will be valued and the more wealth will be created in this country. How do you measure the success of a school in the university? The success of a center is measured by the quality of its graduates, this quality in the training of students is measured from the accreditation by the ANECA of all the degrees we teach or other international accreditations that we have, the improvement of teaching positions , since we will reach 50 university professors (before we could not have any for being a university school) and what certifies success is due to the quality of our graduates’ work. To what extent is the internationalization of the school important to you? In 1987, when Erasmus started in the European Union, we encouraged it in such a way that the following year we had students in France, the United Kingdom, Germany, Italy and Portugal. Then we started the Alfa, Tempus projects, which we coordinated from the School of Valencia. A few months ago we published a book that gathered the experiences of teachers, students and PAS [administration and service personnel] from the beginning to the almost 200 that we sent each year, and the 400 that we currently receive. In the 1990s we started having exchanges with the United States. We have had double and even triple degrees, which has favored that we have graduates working all over the world. 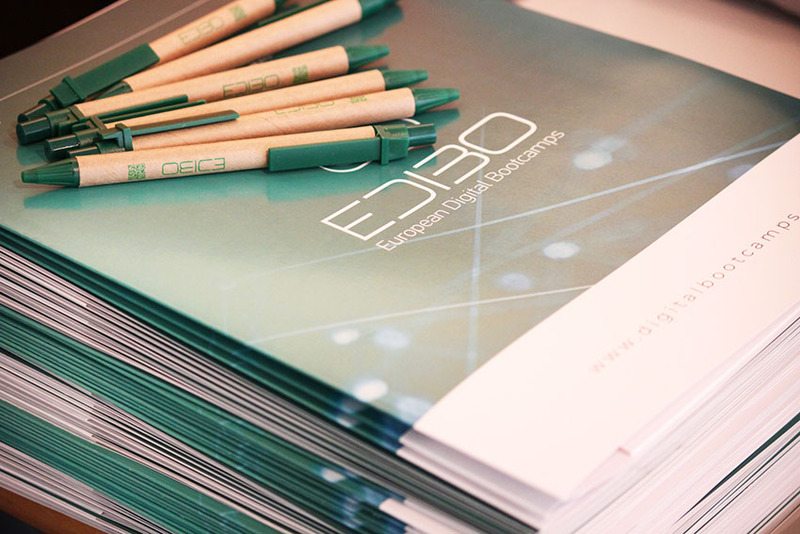 During your time as director of ETSID, what steps have you taken in this regard? In our center, internationalization and business practices and educational innovation are very incorporated, the three pillars in which our study plans are based. There are students who come to Valencia to study for a year, or participate in one of the 1,400 business practices. We have had or have ETSID students from Valencia, the most northerly in Finland, the more east in Japan, the west in the US and Canada, to the south the collaborations with Mexico, Chile, Brazil, Cuba, and with Africa we are developing magnificent collaborative projects for development. How would you like to be reminded by your students? As it happens now when you find some who have not seen you for years and who go with your children, and you notice a good tune, comment where they work, highlight some actions that we developed in school and that has served them in their professional lives. I love that they remember me as a friend they could and can access, who has always been willing to listen and support everyone. Since you began your professional career, have you noticed significant changes among students? And in the teaching staff? The students arrive with different abilities and abilities different from those they brought years ago; in general, they have more command of other languages, a wider digital culture and many already know other countries and cultures. The teachers of our schools have made great efforts to adapt to the technologies that we use today as support for teaching, as well as their incorporation to research to be able to be accredited to new positions, although I would like to have more teachers who would have practiced their profession as an engineer. in the industrial world, but that activity is valued little for accreditations. Spanish engineers are well valued abroad. What would you say are your strengths? In the last 30 years, the implantation of Erasmus opened the possibility that many students (some 3,000 in the school of Valencia) finished their studies in other countries, there they realized that their training overall was as good as that of their classmates from other countries. In most cases they emphasize that their training is of a broader engineer profile; As an example, a mechanic of ours also has knowledge of electricity, automation, economics, all of which makes them easily incorporated into different work environments. In general, do you consider that university studies are currently adjusted to the real needs of the labor market? I usually tell the students that in many cases they will be hired for the first part of the name of their title, engineer, and other times for the second part aeronautical, mechanical, electronic, chemical industrial design. The first part is well worked and is very common in different countries, the second part enters into the debate of whether it has to be very specialized or of a wide spectrum. Personally I would leave the new specializations for a postgraduate education. From 1986 to 2006 he was president of the Conference of Directors of Industrial Technical Engineering Schools and, subsequently, he has held the position of vice president, since 2012. What are the main actions and claims he has carried out? In May of 1986 I was chosen by the team of Minister Maravall to represent the directors of Industrial Technical Engineering in group V of the University Reform; In the last quarter of 1986, I called all the directors of the university schools (EUITI) to take the proposals of our collective to the working group. I have led the proposals that have allowed to have bachelor’s degrees of four years and 240 credits, belonging to group A1. In the white paper presented at the ANECA, I feel very satisfied that deans of schools and more than 250 professors from 40 public universities participated. Collegiate of Honor of the Colleges of Madrid and Valencia and Insignia de Oro by the Galician IT Industrial Council. What do these distinctions mean to you? How is your relationship with professional associations? Personally, it is an honor. It means that the schools that continue the work that we do in school consider you to be one more graduate. In most cases, relations with national deans and presidents have been good; in fact, we count on them in the University Congresses of Educational Innovation in the Technical Teachings (CUIEET) and in the elaboration of the proposals of titles and contents. In the school in which I have been director there are classrooms dedicated to illustrious professors that we have had, and in the Hall of Degrees to a dean and national president, Francisco Garzón. Following the acknowledgments, how do you remember the moment you received the Cross of the Civil Order of Alfonso X El Sabio, granted by the Minister of Education on behalf of D. Juan Carlos I King of Spain, in December 2010? A great personal joy, for my family and for my school. The act, in March 2011, was very beautiful. The delegate of the Government came for the imposition, and in the subsequent meal we also celebrated the 25th anniversary of the director. The petition had accessions of secretaries of state, general directors, deans, school directors, companies and alumni. Have you already thought about your new projects? I am enjoying more of the family, I am still managing final year projects and final year projects and I am preparing a book about my work in educational innovation. Somehow all of you have contributed to form, unite and strengthen our family D.R.O.N.E University UPV Team. In the way of strengthening ourselves and as students we have faced a number of challenges that overpass the theory and practice received in class, of course we are talking about facing life and the very tasks of a relatively new activity for all, as it is what we popularly call Flight of DRONES! We have been successful sometimes making decisions, other times we have not counted on that wisdom that brings experience, however today full of courage, above all of will and firmly believing that we can, we launch ourselves to a new challenge! Next Saturday, February 9, in the facilities of the sports hall of the Polytechnic University of Valencia (our second home) we will have the visit of the racing drones pilot community from all over Spain. Our purpose, among several announcements, is to present to all our calendar of events for the entire 2019 season. As hosts we want to teach the visiting community that our family is united to form new ties that allow us to continue accumulating experience, so this time, the invitation that we send you attached, is to see that day by streaming. According to the agenda, the live transmission will be in different time zones and is scheduled to start at 9:30 approximately and will end at around 6:00 pm. Finally we believe that the bonds become strong with concrete actions, our request is to extend the invitation to your relatives, friends, students. And once in the live a word of encouragement always comes in handy. Do you want to participate in a development cooperation project? Do you want to focus your TFG, TFM or practices to the reality of countries in Africa or Latin America? As every year, the Center for Development Cooperation (CCD) offers its international mobility scholarships for Latin America, Africa or Asia. 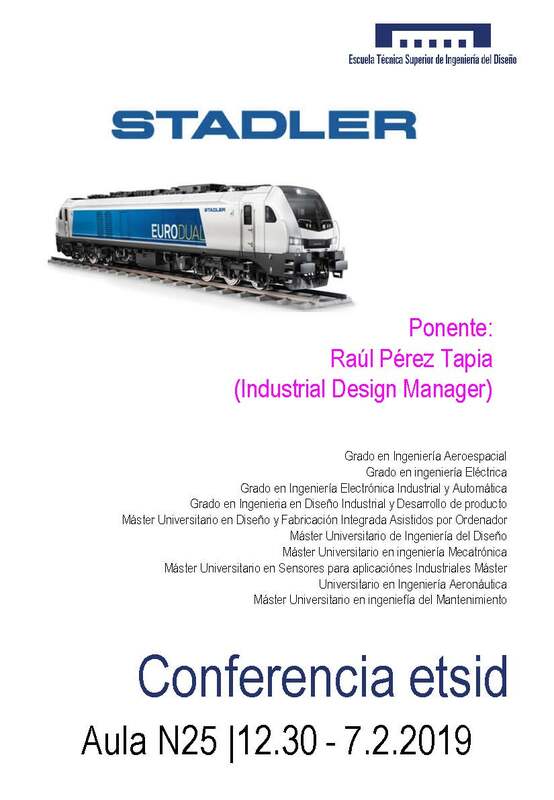 Come to the informative talk of the ETSID and participate, it is much easier than it seems. 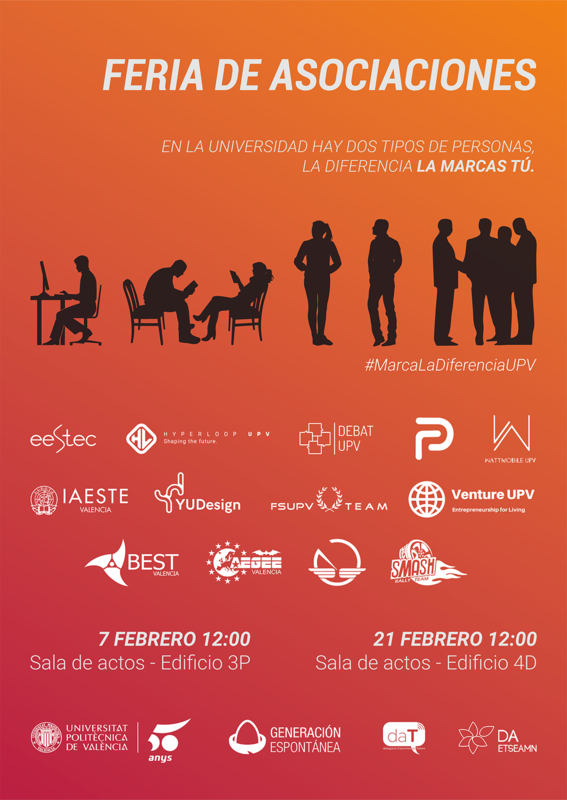 – In Meridies, there are places available for all UPV degrees. You can already know the destinations available on our website. The deadline to submit applications ends on February 29. – In the Cooperation Program, it is the students who must present their proposal, including destination and period of stay. Know the bases of the call. The deadline to submit applications ends on March 5. Once the period of rectification of errors and resolved the claims in this regard, the final resolution is published with the list of candidates according to the scale for the Erasmus 2019/20 auction. You have it available detailed in the tab “See information” within your request for AIR and will soon also appear on the ETSID website. The resolution calls for an informative meeting on news, advice and warnings in relation, above all, to the recognition of studies and the way of proceeding with the proposals of academic agreement, the next Thursday 7, as well as the auction, which will take place next day 14 February, as specified in the resolution. Thursday, February 7 from 12:00 a.m. to 3:00 p.m.
Know first-hand what some of the associations of the university do and how to participate in the activities they offer you. Do not miss the opportunity to complement your studies with the experience of doing something different in your journey on campus. If you want the doors of the UPV not only take you to class, we provide you with the means. Make the decision, get up and make a difference. A team of researchers from the Universitat Politècnica de València (UPV), belonging to the BDSLab Group of the ITACA Institute led by Juan Miguel García Gómez, has developed Wakamola, a bot that will help to know the nutritional and physical activity habits of the population with the object of facilitating the treatment of two global health problems such as, at present, obesity and overweight. Not in vain, according to data from the World Health Organization (WHO), more than 50% of the European population is overweight, and 20%, obesity. And, despite being the cradle of the Mediterranean diet, in Spain, the situation is similar. Thus, in the last 30 years, obesity in Spanish adults has gone from affecting 7.4% in 1987, to 17.4% in 2017; while 37.1% of the population of the state suffers from overweight. In total, therefore, more than half of adults (54.5%) are overweight. According to García Gómez, principal investigator of a work carried out within the framework of the European project CrowdHealth, Wakamola is a bot that, through Telegram, simulates a conversation with the user about his diet, physical activity, diseases, age, weight, networks social, etc. The subsequent analysis of this information will create a network of relationships to study the habits of the population in relation to their diet, physical activity, environment, family network, work and friendships. In this sense, Sabina Asensio Cuesta, researcher of the BDSLab Group, points out that a “remarkable aspect of Wakamola is the hard work done to build an attractive, playful and usable character for the users”. To do this, researchers have developed different scripts and carried out an exhaustive study to choose the most appropriate design for the bot, for which they conducted a survey of 495 people on 52 possible designs proposed by students of the School of Engineering Design (ETSID) of the UPV. 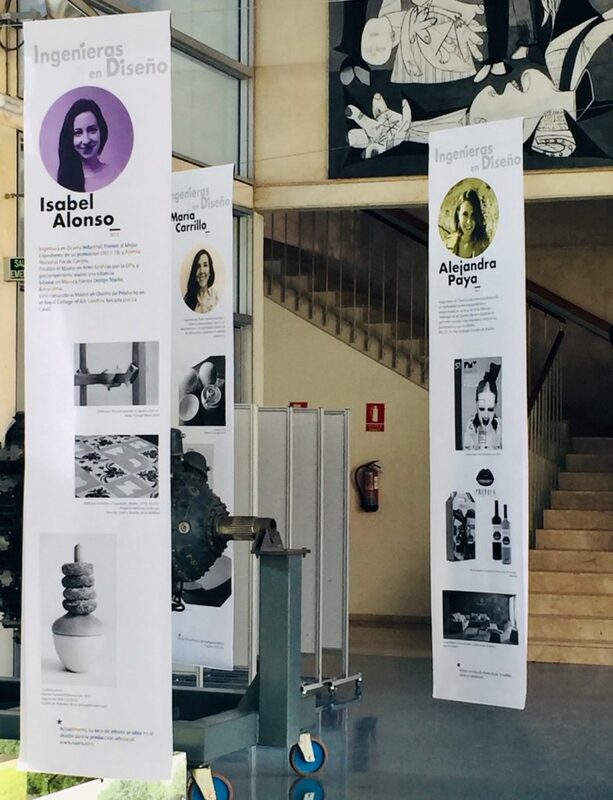 From this survey arose the name, Wakamola, in addition to the character, designed by the students of the ETSID-UPV Mª Dolores Blanco, Ángel Esteban and Marta Lavall. “The objective,” says Asensio Cuesta, “is for Wakamola to help collect a large amount of data from a population on their nutritional habits, physical activity, body mass index, obesity-related diseases and overweight, etc. At the same time, The bot will allow us to determine the importance of the environment on each user, for example, where he lives and with whom he relates (house, family or friends) .The analysis of the data collected by Wakamola can be very useful when preparing actions to try to solve the serious problem of overweight and obesity that our society faces “. Vicent Blanes Selva, researcher at BDSLab-ITACA of the UPV and bot developer in collaboration with Taipei Medical University (Shabbir Syed and Yu-Chuan Li) explains that the operation of Wakamola is “very simple.” From Telegram, the user establishes a conversation with the bot, with questions ranging from your age or weight, to the type of food or the times of the week that you exercise, depending on the user’s answers, a score (Wakaestado) is shown between 0 and 100, depending on your nutritional habits and physical activity, diseases, body mass index and Wakaestado scores of your network, the bot also allows you to see the breakdown of Wakaestado corresponding to diet, activity, BMI, diseases and social network “. On the other hand, for the adequate elaboration of the content and score of Wakamola’s questions about diet, physical activity and personal data (sociodemographic and of diseases), the advice of Ana Frígola, from the Faculty of Pharmacy of the University of València, as well as doctors Juan Francisco Merino Torres, Matilde Rubio Almanza, Salvador Tortajada and Ruth Vilar Mateo, all of them from the Hospital Universitari i Politècnic La Fe. Wakamola is being used, for the first time, in Tavernes de la Valldigna. Thanks to the collaboration of the town hall of the city, until the end of February, this Valencian town will house the pilot study. Finally, note that, to know the bot Wakamola and participate in this pilot study, just look at Telegram @WakamolaTavernesBot or access the following link. Valencia, January 30, 2019. 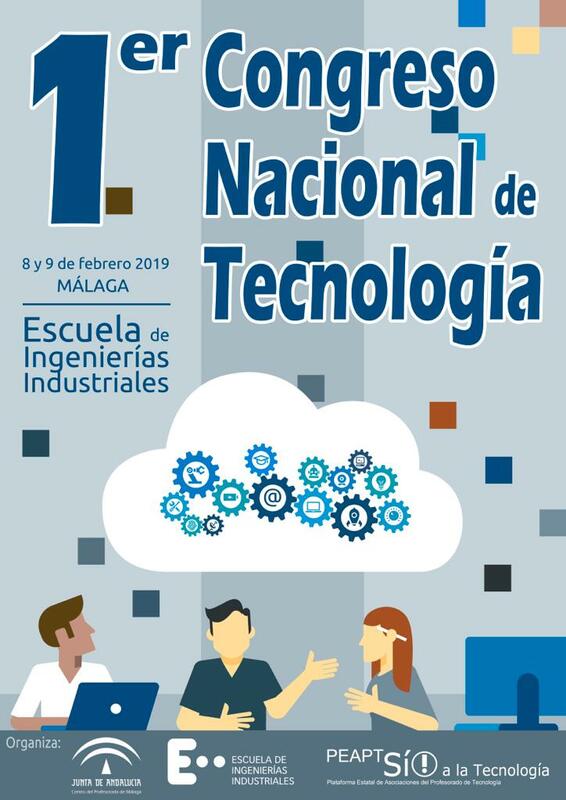 From 5:30 to 7:00 p.m.
We inform you that the State Platform of Associations of Teachers of Technology (PEAPT), the School of Industrial Engineering and the Center of Teachers (CEP) of Malaga, organize the 1st National Congress of Technology, addressed to the teaching staff of Technology of the State , which will take place next 8 and 9 February in Malaga. Specifically, the Congress will be held in the facilities of the School of Industrial Engineering of Malaga (Architect Francisco Peñalosa, 6). From our General Council they have always collaborated with this Platform, and have adhered to their demands in support of technological education in Secondary Education, since the subject of Technology is a fundamental pillar in the current education system. Therefore, our General Council will participate in the aforementioned Congress, with an inaugural conference of our president, Mr. José Antonio Galdón Ruiz, who will also intervene later as a speaker at a round table on “Technology in the Educational System and the Society of the Century XXI “, on Friday, February 8. Later, another round table will be held, “Woman and Technology”, which will feature the intervention of Dª. Ana María Jáuregui Ramírez, vice president of the General Council and dean of the College of Seville, as speaker. Promote a space for updating, improvement and training of technology teachers. Encourage the transfer of knowledge with Engineering Schools. Foster the debate and reflection of the Technology faculty for the improvement of the educational practice. Disseminate good practices in technology education. Analyze and evaluate the present and future of technology education. Analyze, reflect and promote strategies for a greater approach of the students to the technological teachings and the promotion of vocations in these areas. Due to the importance of the topics to be discussed and the interest that we believe can arouse among the colleagues who are part of the Technology faculty, we send you all the related documentation. Plier Bureau, the furniture designed and realized by the student of the Universitat Politècnica de València (UPV) Jon Ander Acarregui, has been recognized with the first prize of the 23rd edition of the International Furniture Design Industrial Competition, organized by the Technological Center of the Furniture and Wood of the Region of Murcia (CETEM). 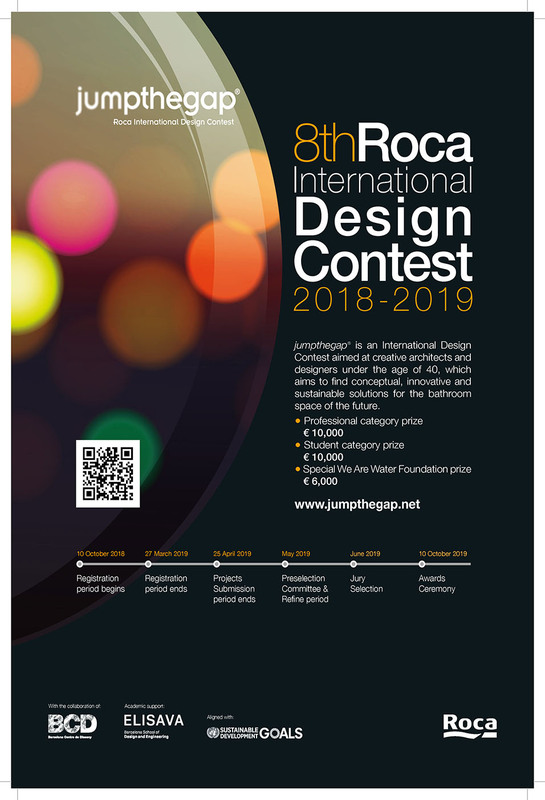 The design of Jon Ander, which has been imposed among the more than 40 projects submitted, from countries such as Mexico, Germany or the United States, in addition to Spain, has received 3,000 euros as a prize and the industrial registration of the project. With Plier Bureau, Acarregui wants to recover the tradition of the secreter, furniture with drawers and a writing board practically in disuse. And he wants to reinvent it with his mind set on young people who want to save space without losing the functionality offered by their storage drawers, in addition to their built-in bookshelf and light. The qualities of this piece, manufactured by Muebles Orga, make it also attractive for use in hotel rooms or halls. Regarding the origin of the idea, it was Amparo Jordá Vilaplana, from the Graphic Engineering Department UPV, who encouraged Jon Ander to participate in the contest when he was studying the subject Product Design for Equipment in the Degree in Engineering in Industrial Design and Development of Products that is taught at the Campus of Alcoy UPV. 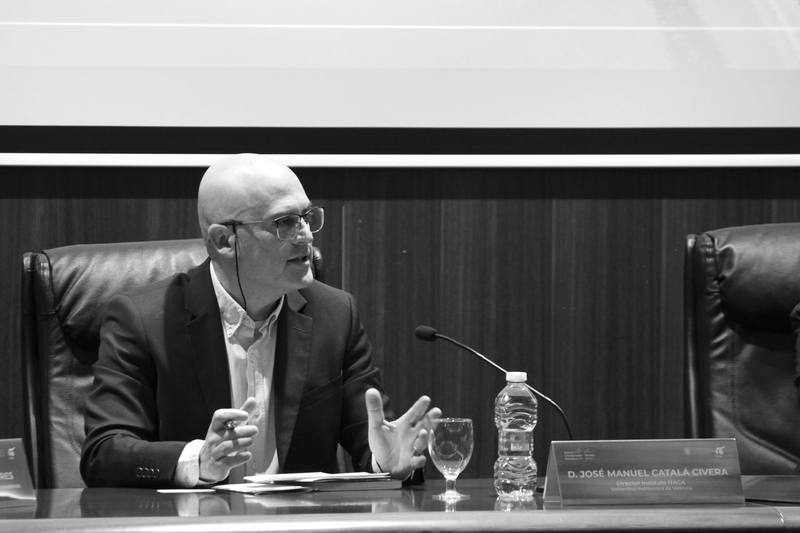 Currently, Jon Ánder Acarregui holds a Master’s Degree in Design Engineering from the UPV. The ICIAM congresses are not ‘another congress’. In no other congress is it possible to observe the most relevant advances and the most current topics in such a wide variety of aspects related to mathematics and its applications. 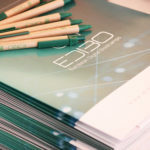 With 27 plenary speakers, 5 recipients of the prestigious ICIAM awards and 3 recipients of SIAM awards, the set of ‘distinguished’ conferences given at ICIAM 2019 is extraordinary, but there is much more. With an ‘Industry Day’, especially dedicated to highlighting the innovative potential of mathematics in the industry, and the wide variety of presentations in minisymposium format, oral contribution or poster, it will be difficult to choose what you want to occupy your time during the congress. With more than 3000 attendees, ICIAM 2019 is the perfect opportunity to establish new contacts, contemplate new potential research lines, broaden job prospects and much more. You will not have another similar opportunity so close to your usual place of work in decades. Meet and get to know the international community! That ICIAM 2019 takes place in Valencia is not a coincidence. The strong development of research in mathematics in Spain in recent decades has undoubtedly contributed to achieving this milestone. The success of ICIAM 2019 and its media coverage will undoubtedly help society to become aware of the effort made in our community to connect mathematics with all kinds of applications. Your participation in ICIAM 2019 makes this effort visible, contributing to revalue the work of all professionals who use mathematics in their daily activity, both before the international community and in our most direct environment. Let’s make ICIAM 2019 serve to reinforce and consolidate the image of our community! We will proceed to modify the hours of service in the ETSID (Secretariat, Subd. Practices in Companies and Subdirectorate of International Relations), so that the schedules coincide with the central services, both with the Student Service and International Relations. 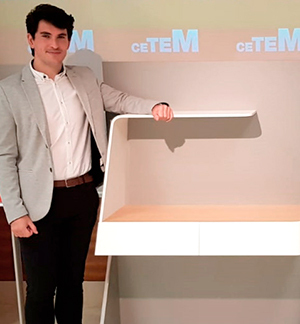 The exhibition “3D Printed Speaker Design” shows the project developed by students of the courses 2017 and 2018 in the subject “Workshop of Models and Prototypes” of the Degree in Industrial Design of the UPV. The project directed by Professor Andres Conejero consists in the design and prototyping by 3D printing of a portable bluetooth speaker. On days 24, 25, 31 and 1 the office will be closed. Responsible teacher Irene de la Torre Fornés, professor of the subject “Color Control for the Product” of the Master in Design Engineering. The Pro Carton Award for the best young designer has become the most successful European award in the field of packaging design. 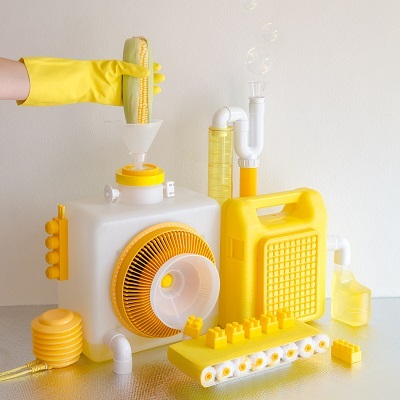 Last year, more than 400 students from 50 design schools from 21 countries participated in the contest. And a new edition is starting! 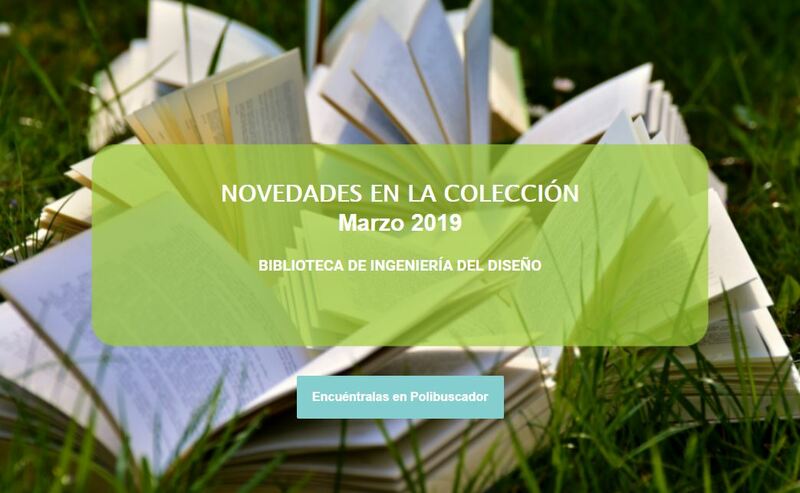 The awarding of the works to the Best Young Designers Award will be open until mid-May 2019, that is why everyone gets the creative stacks! This academic year teachers can include the Prize in the school curriculum. Packaging and cardboard creative packaging: food and drink. Emphasis is placed on cardboard as the material for more sustainable food and beverage packaging and its recyclability. Give us a great design test! Packaging and creative cardboard packaging: this category focuses on the use of more sustainable materials for the manufacture of packaging and packaging not intended for food. Everything is packaged. Look around and get inspired! Creative ideas with cardboard: break the molds! 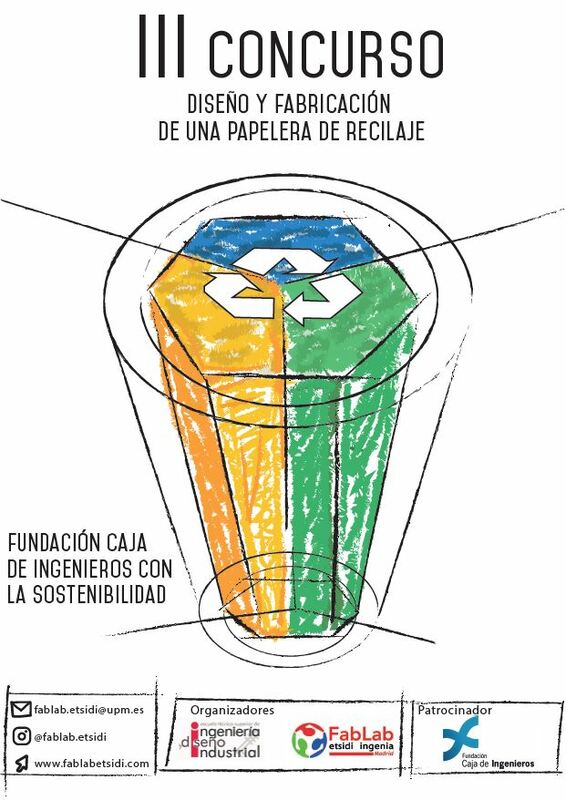 We offer you the opportunity to present your ideas for the cardboard outside the market of containers and packaging. Save the planet: Every minute a truck throws its load of plastic waste into the ocean. Show us your ideas on how cardboard packaging can replace plastic packaging and help us save the planet !! Detailed information and rules on the Pro Carton website! Next Thursday, December 20, at 12:30 in the Assembly Hall of ETSID, we will have the presence of a delegate from MSC Software to offer a talk about the ADAMS / View software, explaining practical and successful cases that may be very interesting. We attach you informative flyer. It is reported that on December 24, 25.31, and January 1, the secretary of the school will remain closed. Speaker: Professor Junji Hirai, professor at the University of Mie in Japan. It is reminded of all the groups, PDI, PAS and Alumnado, that today Tuesday, 11/12/2018 from 9:00h, until 12:00h on Wednesdays 12/12/2018, the online voting period will be open For election to Director of the ETSID, said vote will be made from your personal intranet. 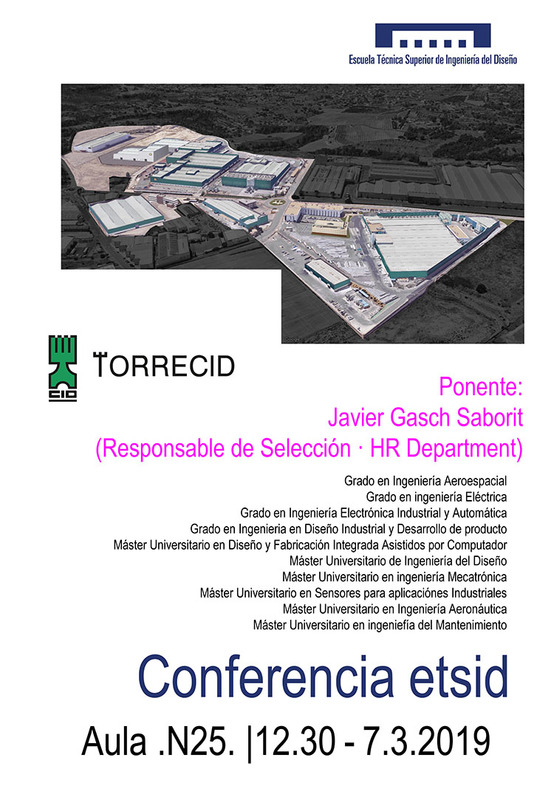 The President of COGITI, Mr. Jose Antonio Galdón Ruiz, will give a lecture next Thursday, December 13, at 12:30 in the ETSID Assembly Hall. The ETSID Library will open during the two Christmas shifts (from 12/26 to 12/28 and from 2/01 to 4/01) from 8:00 a.m. to 3:00 p.m.
SAFEman, the advanced system to improve the protection of firefighters and their communication with emergency centers before a forest fire created by Jorge Sancho Muñoz, student of the Degree in Aerospace Engineering at the School of Design Engineering of the Polytechnic University of València (ETSID-UPV), has been proclaimed winner of the Comunidad Valenciana Challenge of the European Satellite Navigation Competition (ESNC). It is also the second time that, consecutively, Jorge Sancho achieves the victory in the aforementioned contest. 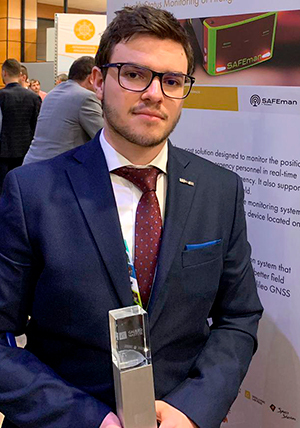 In addition, it should be noted that SAFEman has been chosen by the European GNSS Agency as one of the ten best projects of this year. SAFEman is made up of two devices: a small bracelet (similar to those usually used for sports) that is responsible for monitoring the firefighter, and an integrated system in the fireman’s helmet that includes all electronic elements, antennas, etc. , in addition to some signal lights for, in case of poor visibility, to be located more quickly. In case of forest fire, SAFEman allows to have located in real time – through GALILEO, the European GPS – to all the members of the fire brigade, so that you can see if the fire is enclosing them and, in such case , trace the most optimal escape route. In addition, the wristband allows the firefighter to send an emergency signal to the control center, or if it detects that the firefighter is on the ground and does not move, or has the pulse too high or too low, directly, an emergency signal is triggered for your evacuation. “The system,” explains Jorge Sancho, “allows continuous monitoring of emergency equipment at a relatively low cost and individually, instead of having just located a point, which would be the entire brigade.” In addition, a communications network is formed between the fire brigade to get the signal to the control center. “In case this is not possible, for example, in a very closed valley, you can use my idea from last year, Stratolloon, as a high altitude repeater to get the signal,” says Sancho. David Argilés, managing director of the Valencian Space Consortium and coordinator of the contest in the Valencian Community, affirms that, with his triumph of this year, “Jorge Sancho has become the first person to win two consecutive editions, which is worth mentioning taking into account the high quality of the proposals we receive. ” In 2017, his Stratolloon project was also selected as the best in the whole Valencian Community and chosen among the ten best in Europe. Stratolloon is the first system in the world that guarantees the controlled landing of payloads from the ground to the stratosphere and vice versa. In addition, it also incorporates a monitoring application that remains active throughout the flight. “Likewise,” adds Sancho, “in the future, Stratolloon will serve as a communication platform for exceptional situations, so that it will avoid having to locate base stations on land, which SAFEman could benefit from”. 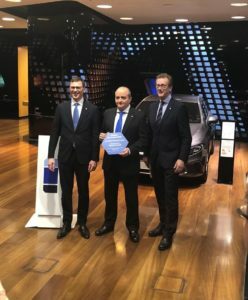 The European Satellite Navigation Competition, which celebrates its tenth edition this year, rewards the best services, products and innovations that use satellite navigation in everyday life. Its long-term objective is to strengthen Europe’s competitiveness with high-tech space solutions on a global scale. 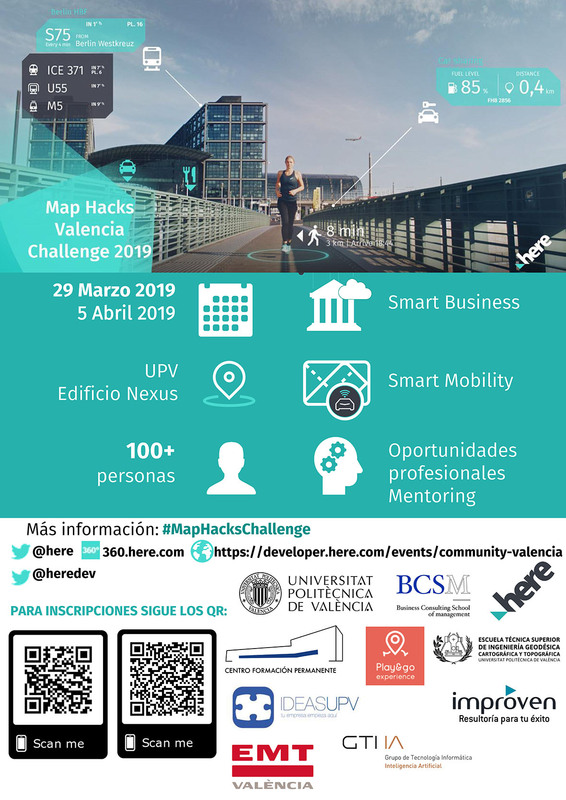 The coordination of the European Satellite Navigation Competition in the Valencian Community is carried out from the Valencian Space Consortium, in collaboration with the five scientific parks of the same: Espaitec – Parc Científic, Tecnològic i Empresarial (Universitat Jaume I de Castelló), Polytechnic City of Innovation (UPV), Parc Científic (Universitat de València), Scientific – Business Park (Miguel Hernández University of Elche) and Alicante Science Park (Universitat d’Alacant). A team of Makers UPV, the student community of the Universitat Politècnica de València (UPV) that transcends the merely academic field, has achieved victory in one of the 11 categories of Junction, the largest hackaton in Europe, held at the University of Aalto (Espoo, Finland), in which they have also achieved the 4th place in the general classification. The team, integrated by Jaime Laborda Macario and Iván Torres Játiva, both students of electronic engineering; Enrique Miralles Dolz, of nuclear fusion engineering; Joaquín Montesinos Muñoz, of telecommunications engineering; and Matías Fernández Patón, of biomedical engineering; has been imposed in the Future Cities category with GuideMe, pocketing a cash prize of 1,000 euros. In the hackaton, carried out in collaboration with the Movesense platform, more than 1,400 developers from around 100 from different countries have participated, who have had to face the challenges posed by fifty prestigious companies of Facebook, Daimler, Supercell, Nokia or Intel. To achieve its success, Jaime, Iván, Enrique, Joaquín and Matías developed GuideMe, a comprehensive solution for the exterior orientation of the elderly or disabled in a connected city, through a fully functional cane that provides clear and concise directions to move between different points of the city, improving their quality of life. The system, which in turn allows the instant sending of information to avoid slopes or sidewalks in poor condition, or know the real state of the traffic lights, is open to implementation in public places such as hospitals or train stations, in addition to facilitating emergency interventions. In the words of the award-winning team, they have developed “a proof-of-concept prototype to test and demonstrate the technology.” The walking stick concept test consists primarily of an intelligent handle with some electronic components, such as an LED array with a compass. digital (MicroBit) and a WiFi node to transmit all the information between the GuideMe smart stick and the web application server and the GUI. ” In turn, “the electronics of the handle consists of a MicroBit board with a 5×5 LED array and a digital compass connected to an ESP8266 WiFi microcontroller that acts as an IoT node to transmit information to and from the server. It is integrated in a handle printed in 3D as a box with the stick.The MicroBit board is programmed using MicroPython, an efficient implementation of the Python 3 programming language optimized to run on microcontrollers.Wemos ESP8266 is programmed using Arduino IDE, a creation platform of open-source electronic prototypes that allows users to create interactive electronic objects. ” “In addition,” they add, “we have also developed a graphical user interface for demonstration purposes that indicates in real time the location of the older person holding the club, which could be used by adults to know the location of their relatives. The web application is updated with every movement that the elderly person makes and is able to optimize the best way to reach the objective location “. “For the web application, the backend API is developed entirely using PHP and is combined with HTML, CSS, JS, JQuery and AJAX for the interface”, the winners conclude. • Practices in Finance: you will accompany our global financial organization in its tasks of financial analysis, consulting and auditing. • HR practices: In 2018 3M has become the best place to work, do not miss the opportunity to learn from our great team of talent and development. • Engineering practices: We want to know your innovative ideas, with our support you will be able to face the biggest challenges of the manufacturing industry and the supply chain. • R & D Practices: You will have the opportunity to work with fascinating technologies that will be the basis of the most creative products of tomorrow. • Marketing practices: you will work together with our marketing leaders in business development, strategy and marketing projects with 25 global divisions. • Information technology (IT): get involved in important projects and take advantage of the excellent training instilled by our leaders. Requirements: university studies related to the area where the practices are performed, have full-time availability and be willing to sign an internship agreement. 4 positions currently open, but 24 will open during the year. There is no deadline for registrations, since it is a living process in which new profiles are always searched. The duration of the internships is 12 months and has a remuneration of € 800 per month. All members of the ETSID (PDI, PAS and students), who have started the electoral acts, are informed of the School Director. Voting can be done telematically, accessing the intranet, from 9am on Tuesday 11/12/2018 until 12pm on Wednesday 12/12/2018. Last weekend was held in Seville the V national contest of scientific technical tunas. First prize for the Best Tuna. Award for the best flag dance. Award for the best Parade. The UPV launches its program of solidarity practices, through the Center for Development Cooperation (CCD) and the Integrated Employment Service (SIE) thanks to the collaboration between the Vice-Rectorships for Social Responsibility and Cooperation and the Employment and Entrepreneurship. Solidarity practices are those practices developed in national territory that are carried out in non-profit entities or social and solidarity economy companies whose statutes reflect certain social values. The platform to register for the 2019 edition of the Technovation Challenge is now open! After the success that our Valencian Community has had in its first year of participation in the Technovation Challenge [with more than 450 participants and leading Spain for the first time to the final in Silicon Valley (only one team can arrive for each of the categories and by continent, and there have been our Junior and Senior teams, bringing the Junior team the silver medal), I am writing to invite you to participate in this program as mentors or volunteers. The Director of the American Space VLC, Debra Westall, will offer an informative talk on Thursday, November 29 at 12:30 in the ETSID Assembly Hall. We hope to have your presence! The awarding of the works to the Best Young Designers Award will be open until mid-May 2019, that is why everyone gets the creative stacks! This academic year teachers can include the Prize in the school curriculum. Four opportunities to win The works can be presented in four categories: Packaging and cardboard creative packaging: food and drink. Emphasis is placed on cardboard as the material for more sustainable food and beverage packaging and its recyclability. Give us a great design test! Packaging and creative cardboard packaging: this category focuses on the use of more sustainable materials for the manufacture of packaging and packaging not intended for food. Everything is packaged. Look around and get inspired! Creative ideas with cardboard: break the molds! We offer you the opportunity to present your ideas for the cardboard outside the market of containers and packaging. Save the planet: Every minute a truck throws its load of plastic waste into the ocean. Show us your ideas on how cardboard packaging can replace plastic packaging and help us save the planet !! Detailed information and rules on the Pro Carton website! The winners of the 4 categories plus the 6 finalists will be invited, along with their teachers, to the Gala Dinner of the Awards that next year will be held in Malta. The prize for the winners of the 4 categories consists of a visit to the Stora Enso factory and a practical training at AR Packaging in Sweden. Of course, with all the expenses paid! All finalists will receive framed certificates. To inspire you, check out the winners, finalists and preselected Pro Carton Award Young Designers and watch the videos to get an idea of ​​the Awards Gala. We will gladly support you with Publications on cardboard and cartonboard packaging and, above all, with the delivery of free cartons for your design work. We want to provide a practical first-hand experience to the students! 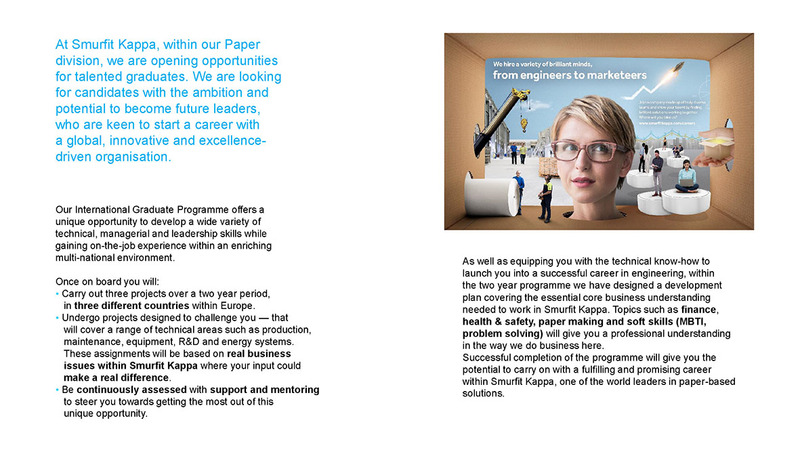 It is also possible to arrange visits of Pro Carton members to your school or university and hold seminars on the many options offered by cartonboard and carton packs (design, technology, production, marketing …). Request the respective order form on the Pro Carton website. 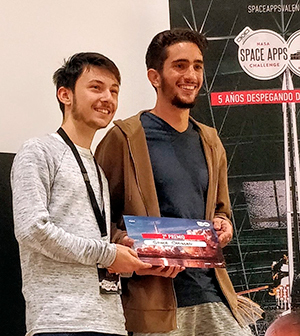 Juan Roberto Robles and Víctor Callejas, members of Makers UPV, the student community of the Universitat Politècnica de València (UPV) that transcends the purely academic field, have overcome the local phase of Space App Challenge, the international hackathon that NASA convenes annually for developers, designers, scientists, engineers, entrepreneurs or students, who are invited to try to solve one or several proposed challenges. 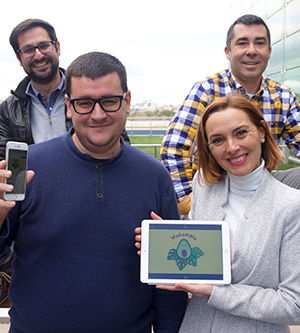 Space App Valencia took place from October 19 to 21, simultaneously with its completion in more than 200 cities around the world. It was attended by 60 participants divided into 6 teams, of which only 2 have achieved access to the final phase of the Space App Challenge, where they will compete with the rest of the projects nominated globally. Callejas, student of the Degree in Computer Engineering (ETSINF-UPV), and Robles, student of the Degree in Aerospace Engineering (ETSID-UPV), form the Space Odyssey team, which finished in second place the aforementioned local phase with Hal 9000, an assistant spatial design with self-scalable architecture that notifies and informs about new releases, besides helping to solve doubts about space and even create works of art. Thus, Space Odyssey, also awarded in the local phase with the Best Concept Mission award, aims to repeat the successes achieved by students of the UPV in 2016, when Mars UPV reached the top 5 of the international contest, or in 2014, year in which Space Helmet was proclaimed absolute winner of the Space Apps Challenge in the Public Decision category. Now, it will be necessary to wait until the beginning of December, date in which the 30 finalist projects will be announced and, in case of reaching this milestone, in mid-January 2019, which will be when the jury of the contest makes the winning projects public. . Good luck! Next Friday, November 23, the ETSID Library will be closed in the afternoon. It will only be open in the morning, from 8:00 a.m. to 3:00 p.m.
has become one of the 50 best in the world. classification through objective evaluation criteria. around the world. Therefore, it is the best valued course of all those offered in the set of Spanish universities. exercises, videos, small and audio texts to improve pronunciation, to glossaries, practical activities and questionnaires. Likewise, it also includes grammar cards and recommendations on external Internet resources to continue learning the language. 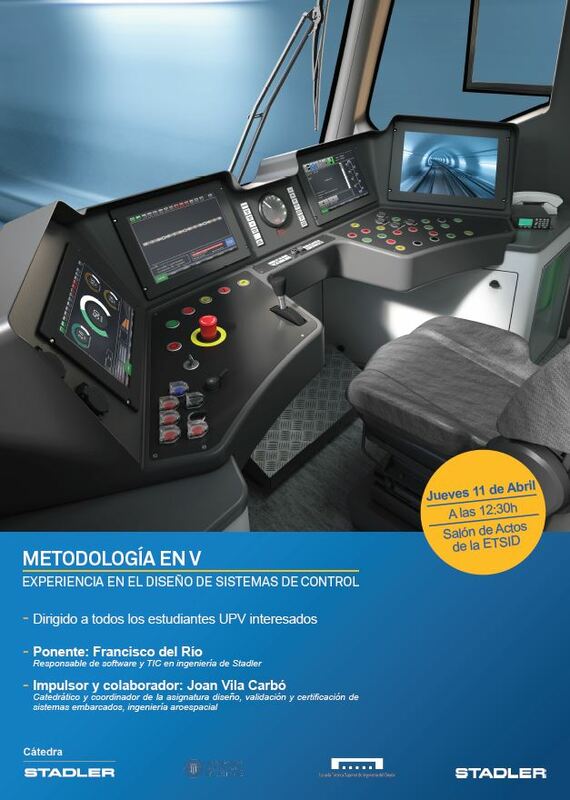 The UPV, international reference in the field. enrollments in edX, the mass open online courses platform promoted by Harvard University and the Massachusets Institute of Technology (MIT). Renewable Energy: the main source of energy in Bhutan. In the dropdown menu of the ETSID menu, the section “ETSID Logos” has been added. There you can download the official logos of the school in various formats so that you incorporate them into your academic documents. 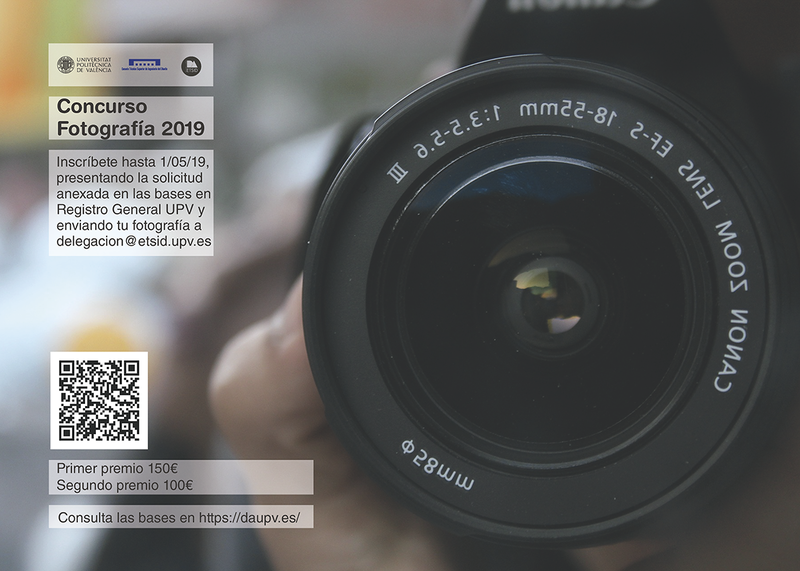 The call for ONCE CRUE – UPV Foundation Practices Scholarships , 2018 – 2019. In the “Internships” section of the menu, the “List of Internship Companies for ETSID students” tab has been updated. 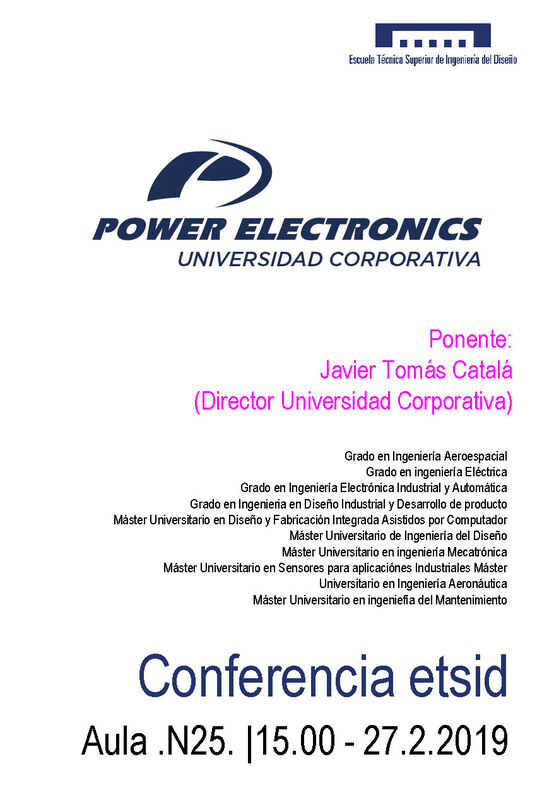 In this page you will find the list of companies in which the students of the ETSID carried out internships during the past year 2017, ordered by Degrees and Masters. You can also click here to see the lists. Are you interested in knowing the Biomechanics Institute? Come and meet us! We invite you on Tuesday 11/20/18 to an open day to this leading research center that occupies the 9C building of the Vera campus. We will start at 9:45 and finish at around 12 o'clock. You will have the opportunity to visit its facilities and learn more about the activity we do, you will be surprised! And if you like what we do here and want to have the opportunity to be part of this exciting project, we'll tell you how! and Telecommunications. You can see the list of masters in the pdf attached. November 16 from 8:45 to 12:45 at the AITANA Laboratory of the ETSID in the 2nd Floor of the North wing. Punctuality is requested. The use of laptops is advised. A team of 16 students from third and fourth year of the Aerospace Engineering Degree from the Universitat Politècnica de València (UPV) is working on the construction of the ultralight aircraft Zenith STOL CH 701. 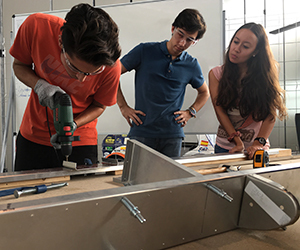 The project, born thanks to the Vicente Silvestre Foundation and Consuelo Juliá, who have donated the plane in pieces -5,000- so that the students can put into practice the knowledge acquired, is coordinated by the UPV professor Carlos Vila Pastor. 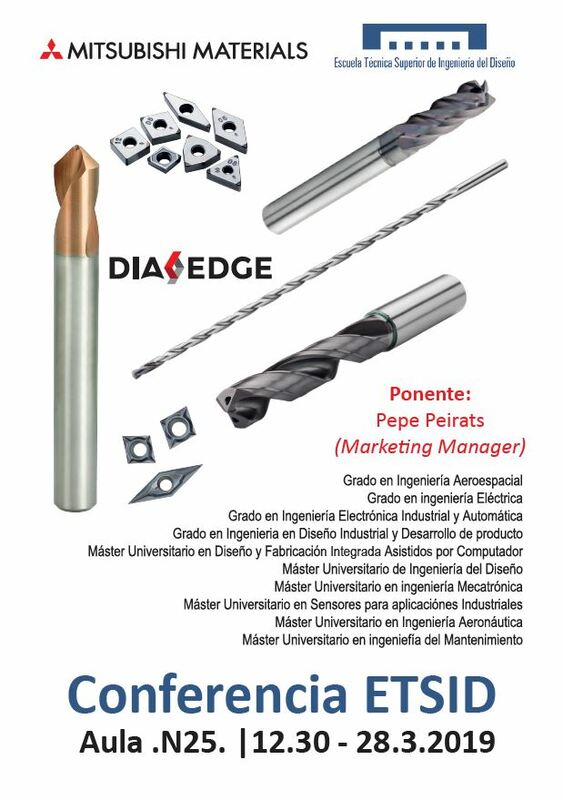 The work team meets every Wednesday at the Pedro Duque hangar of the School of Design Engineering (ETSID-UPV). There, as Carlos Haro explains, “you can learn to apply the theoretical knowledge that is acquired in class after much effort”. This practice is key for students. In that aspect, Alicia Muñoz says: “I’m learning a lot about the manufacturing part, what I like most is to be in contact with the plane. 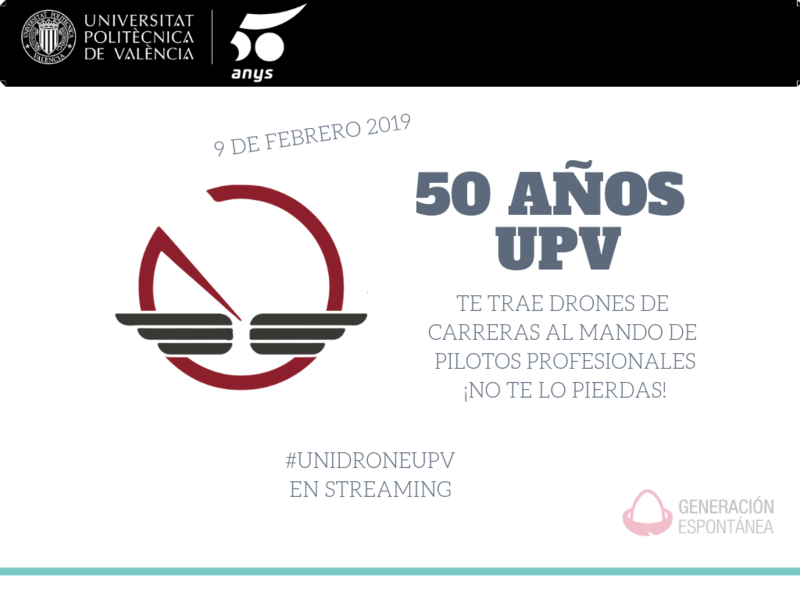 In any case, the objective is to take the practice to the end, since, as Vila indicates, “we want to pilot it and be the first Spanish university to have a plane assembled by the aerospace engineering students themselves”. To this end, the UPV has requested the Spanish Air Safety Agency (AESA) to monitor the assembly, so that, at the end of certain phases of the project, one of the engineers of the agency supervises, in the hangar, that the assembly It is correct and conforms to the aeronautical regulations. So, if everything goes well, the idea is that by the end of this year the aircraft is completely built and, after the approval of the AESA, the engine and the rest of the ultralight instrumentation, which weighs less than 450 kg and measures 8 meters in span, 6’5 in length and 2 in height. In the section ETSID, in the tabs Permanent Board, Center Board and Academic Committees, a link has been added to the scheduled meetings. In the Secretary’s office tab, the drop-down menu of Classrooms and Workshops has been modified, now including their location. Besides, another drop-down has been added with the degree exam calendars corresponding to the 2018-19 course. It is public knowledge that Columbus did not discover America; and it is well known that before Gutenberg, a few pages had been printed. The lesson here, which will be exposed by Professor Diego Vainesman, with a minimum of seriousness, is that who does not announce, does not win. This statement in no way speaks negatively of the Scandinavian communication, (or rather the lack of it), which left the Vikings without their place in history as the first daring who arrived in the new world or the Chinese as the pioneers of the mobile types. Not in any way. This dissertation explores the capacity, almost unlimited, of communication to establish a point that is opposed to the already well-known phrase: “history is written by those who win”. The true story in this case is written by those who communicate it. Diego Vainesman, who was president of the Type Directors Club of New York, will present his particular vision of how creativity in communication allows logos, products and, why not, conquerors to be the owners of an exciting visual narrative. A small story in which Diego hopes to share something special about an ancient art, which feels very at home, in a digital and ultra-technological world in which for many, creativity is just a detail that stays in time . Place: Hall of Degrees Francisco Garzón, South Wing. Low level. Building 7B ETSID. 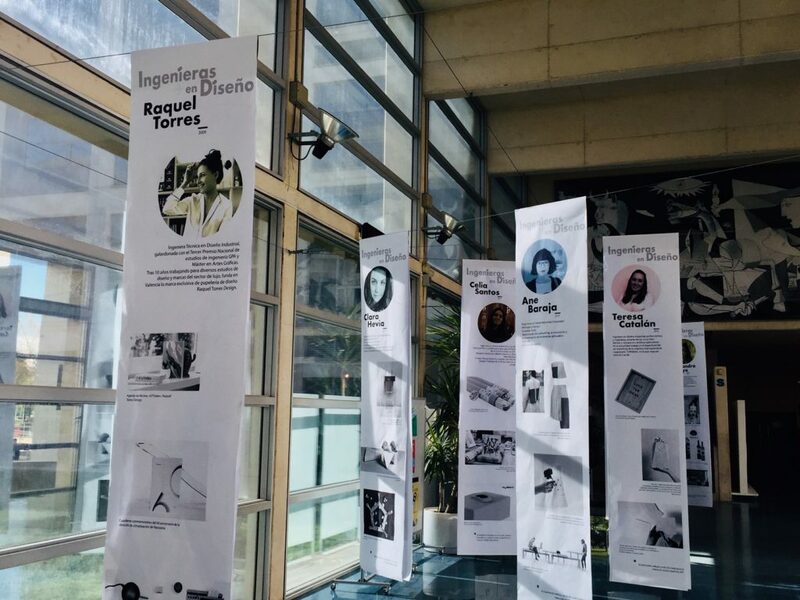 Through real stories of extraordinary women coming from different regions of the world, we will illustrate the condition of women in South America focusing on Peru. Its reality will be contrasted with our situation in the European context to understand the differences and look for the similarities and bridges of union between both environments. During the second part of the day, the dialogue between the public and the speakers will be opened in two round tables to propose new points of view to the approaches dealt with during the presentations. Sign up for the event here and participate in this meeting. The deadline for applications for the Erasmus 2019/2020 call has been opened. All information can be found through the student’s intranet in the section Services => International Relations and Cooperation => International Mobility and Cooperation (AIR). Once the AIR application is opened, you have to click on the Calls block, in which Erasmus 2019-2020 ETSID says. In the Documentation tab you will find the general bases of the call, the specific ones of ETSID and the language equivalence table. An updated list of available places in each university for the different degrees of the school will also be available shortly. The application deadline will be open until next November 30.
hours to complete, during three days, 10 kilometers by swimming, 421 kilometers by bicycle and 84 kilometers by running. has been awarded the National Comic Award for 2017 for her work We are all all right. turn becomes the first woman in history to obtain this award. repression, the feminist view of an era ...". something happened in their lives. " seventh edition with Buscando un sitio. The history of the current School of Engineering Design begins with the reform of 1851, it was formalized with the subsequent publication in La Gaceta de Madrid (May 22, 1855 No. 871) of the Royal Decree on the Industrial Schools Plan. In Title III “vocational schools” where the materials and structure of vocational education are articulated, Article 14 says “For now only in Madrid, Barcelona, ​​Seville, Valencia and Vergara will be professional schools”. Since the beginning of its existence, the School of Valencia, like the rest of Spain, it has been subjected to numerous changes in both structure and function, name, etc … not in vain, has always been evenly matched terms “professional”, “application” and “industrial”. That is why, it is complex to tell the story of the School of Valencia, documentation is scarce and often streaky. You can follow the story through its operation or, rather, by the laws that have regulated both academic aspects and the professional attributions . Therefore the current ETSID is an evolution of the center created by Real Decree of 22 May 1855 in the Gaceta de Madrid in the city of Valencia, along with schools in Madrid, Barcelona, ​​Seville and Vergara. Subsequently, the School of Valencia has continued in line form in their classrooms most university graduates who have helped to consolidate the industrial fabric of the Valencia region. In Spain, it can be considered, that studies of industrial engineering starting in the year 1850 by the Royal Decree of the Ministry of Commerce, Education and Public Works, of September 4, in which the Minister, Manuel de Seijas Lozano, proposed to SM Queen Elizabeth II the creation of the Industrial Schools. Industrial in three grades: Elemental, Expansion or Professional and Superior. Curriculum Extension Schools established in the art. 14 of this R.D. School Valencia is already mentioned in the Organic Plan Promoting Schools May 20, 1855, as Minister Francisco de Luxán. Although the teachings and have started in Valencia in 1852. The first reform of industrial teachings was made by Royal Decree of the Ministry of Public Works on September 9, 1857, to enact the “Law of Education” by the Minister Claudio Moyano. In the aforementioned Law School rises Valencia School Superior.Por the rank of Royal Decree of 28 April 1861 authorizing the Industrial School of Valencia to admit exam Bachelor of Mechanical Engineers and Chemists. By Royal Decree of 17 August 1901 the rank of High School of Industry to Valencia is confirmed. During 1906-1907 the Industrial School of Valencia refundó. As seen, our school is really the oldest of Valencia, which perhaps may surprise more than one and is, therefore, an age which far exceeds the century. However, if you stick to the written documentation available at our Center, the School of Valencia is recast by Royal Decree of 19 December 1906 as Minister of Public Instruction illustrious Valencian Amalio Gimeno. César San Ramon was appointed Commissioner director to lead the process of re-founding of the School of Valencia during the course 1906- 1907. Selected teachers and constituted the cloister was appointed Director Jose Alapont Ibanez, starting to work in the 1907- 1908 course with 150 students about. Initially the classes were held in the municipal building to recayente Street Arzobispo Mayoral, aimed at Normal School, with which classrooms and shared services, but lacking laboratories and workshops. Thanks to the offer made by the industrial Bartolomé Montañés of their own workshops in the industry La Primitiva Valenciana, was able to organize practical lessons. In 1923 it moved its theoretical activities to classrooms Luis Vives 31 May 1925 the then Institute Head of Government, General Primo de Rivera, laid the foundation stone of what which should be the building avenue Antic Regne de Valencia. The extraordinary vitality of our school requires successive enlargements made in 1933, with extended premises for the section metallography, in 1940, with the expansion of the craft workshops and the construction of a new plant for classrooms, and in 1965, construction of the new pavilion Laboratories. Industry High Schools initially depended on the Ministry of Commerce, Education and Public Works. Subsequently was dependence of the Ministry of Grace and Justice in a relatively short time, to be included later in the Ministry of Development. In 1928 and R. D. of 21 December, the Higher Schools of Industries go to the Ministry of Labour and change its name to High Schools Work. By R. D. of September 19, 1931 are included in the Ministry of Public Instruction and Fine Arts under the name School of Industrial Experts. Act of April 29, 1964, on “Technical Education” are renamed Schools of Industrial Engineering. Finally, the General Education Act of 1970 joined the University under the name of University Schools of Industrial Engineering. Property exhausted the possibilities Avenue Antic Regne de Valencia, has built a new building for the location of the school on the campus of our Polytechnic University, being Rector D. Justo Nieto Nieto and School Director D. Enrique Ballester Sarrias, this building will be inaugurated by the Minister of Education cipria Ciscar in the presence of the Minister of Education and Science Mr Javier Solana Madariaga, on July 25, 1989. Classes will continue to give in the previous building, today Roads II, until the inauguration of the new and current ETSID building on the campus of our Polytechnic University, being Rector D. Justo Nieto Nieto and Director of the School D.Enrique Ballester Sarrias the July 25, 1998, provided it with greater features such as: Improved tutorials, there are more firms authorized to do so; greater range of computer classrooms; classrooms for lectures; room larger library, laboratories for teaching and / or research, offices for more than 100 teachers, planetarium, bodeguilla, parking, power supply through the photovoltaic plant. Industrial Electronics and Automation eng. Start dates for 2019 is beginning of April. ¿TE GUSTARÍA TRABAJAR EN EL SECTOR AUTOMOCIÓN? According to OFFICIAL COMMUNIQUÉ of UPV: Given the evolution of the cold drop throughout the afternoon of Thursday, and following the recommendations of the authorities, the UPV has decided to suspend all activity (academic and work) in its three campuses for tomorrow, Friday, October 19.
cistobal@upv.es sent from an official address of the UPV, indicating the name of the person who signs up and the current career and course. A personalized email will NOT be sent confirming the place. The course is taught by the company BigML. Valencia, Spain, to promote innovation in the Turia capital and attract talent from all over the world. network, clustering, anomaly detection, association discovery, and classification and analysis tasks of texts by subject or topic (topic modeling). remote services or locally, integrated into their applications, to finally be able to make predictions and make highly automated decisions based on data. – Why do you have to do practices? – What are the types of practices that can be carried out? – How do I look for a practice? Coup2Boost is an initiative carried out by Epoka, STEF provider for Trademark projects at a European level. The project consists of a contest for the financing of student projects in Europe and also support associations, research departments, incubators or supervised projects that are part, either of educational projects, or of personal projects and entrepreneurship. Dissemination of the call in the selected centers. The projects will be evaluated by STEF for the election of their five favorite projects. 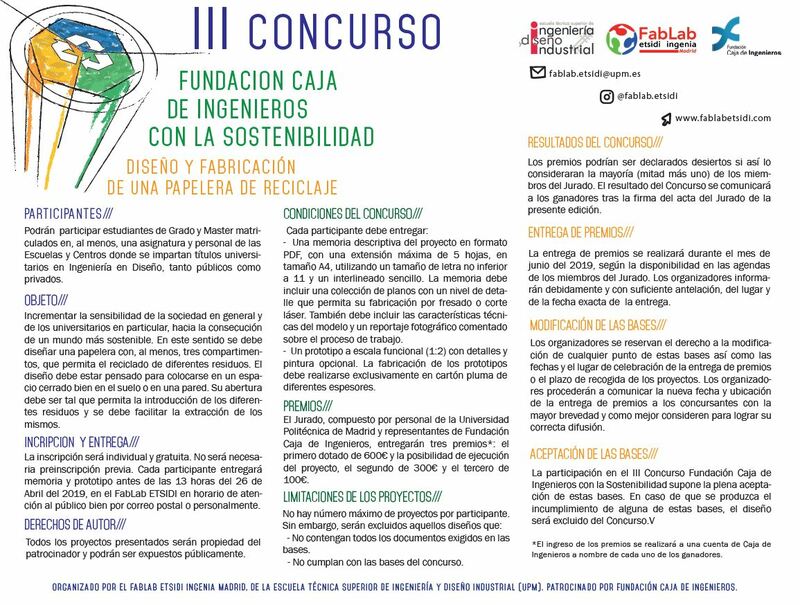 The representatives of the five finalist projects will travel to Paris to present their project (in English), with all expenses paid. In this presentation, together with the rest of the European candidates, the winners of the first prize / second prize / third prize will be decided. The International Relations Branch of ETSID, when the date of the Erasmus call for the next course is approaching, and taking advantage of the fact that Professor Enrique Ruiz Zúñiga, coordinator of exchange programs at the School of Engineering Science of the University of Skövde ( Sweden), will be visiting our school for a few days, has organized an informative talk about the possibilities and advantages of an Erasmus stay at your university, especially in bachelor’s degrees (degree) in Production and Automation Engineering (for our students of Electronics and Automation), User Centered Product Design (for Design students) and Mechanics of Materials (students of Mechanics). Although currently the offer of masters is smaller in terms of these degrees, it will also bring us the news about the master’s degrees that, in the areas of Electronics, Mechanics and Design, have been introduced in Skövde since the current course 2018/19, so which is also an option that may interest the Master’s students in Mechatronics, Maintenance or Design. It is also a special opportunity to learn first hand what it would be like to do an Erasmus stay in Sweden, since Professor Ruiz Zúñiga will answer any questions you may have in this regard. The talk will take place next Monday, October 15, at 12:15, in the ETSID Degrees Hall (ground floor, South wing). The Global Management Challenge is the world’s largest Strategy and Business Management competition based on simulation, in which participating teams (3-4 people) take charge of virtual companies competing with each other. The development of the competition is carried out through decisions at the level of the board of directors, based on the study of the history of the company, the business strategy and the predictions that can be made about the future of the market. The simulation has 38 years of uninterrupted development history, adapting to the evolution of markets and competition with the aim that the people who participate do so in a context very similar to reality, is certified by the European Foundation for Management Development (EFMD) in Technologies for advanced education (CEL) and adhered to the strategy of entrepreneurship and young employment (EEEJ). He has recently received the Young Talent Seal INJUVE. 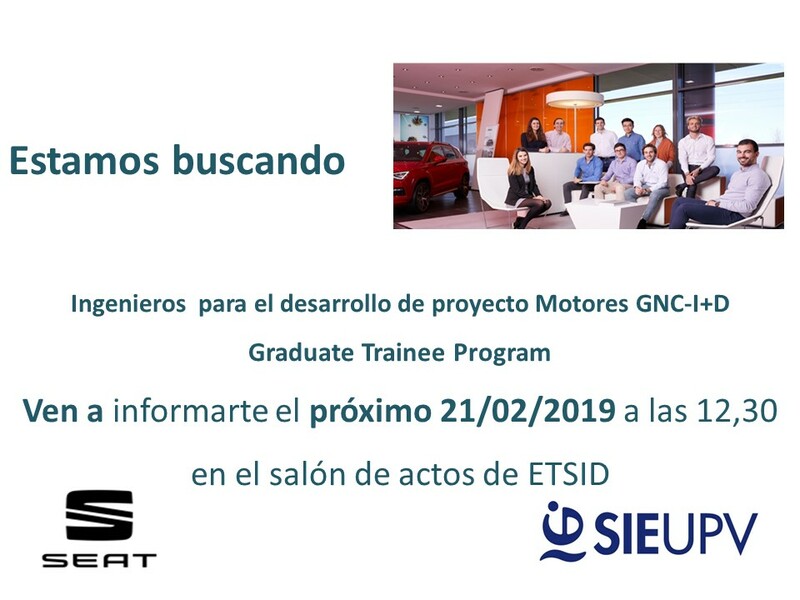 Would you like to work in the Automotive sector? !We will wait for you! areas of the automotive sector will be at your disposal to inform you in detail about the day by day and the demands of his position. that could hire you in the future !. what their requirements are when filling the positions of their organizations. 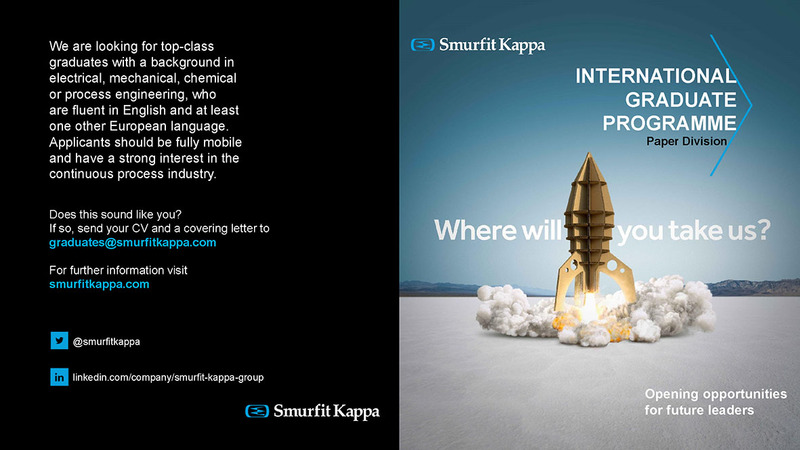 the positions requested by the industry, it is essential that we all inform you of this opportunity. 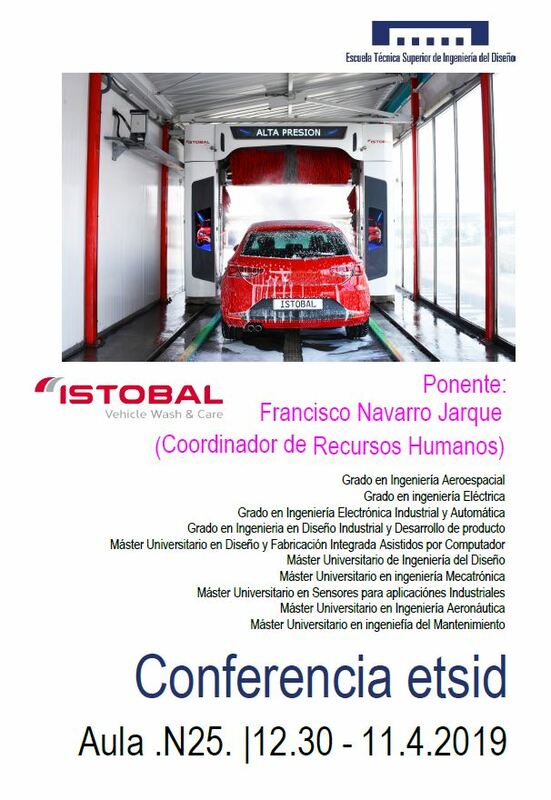 Novatec, Nutai, Faurecia, Lear, CLR, Gestamp, Autoliv. So it will be an opportunity for you to approach them and meet their needs. Inscripciones hasta el 14 de septiembre. Cada proyecto tiene su descripción y la titulación a la que va dirigida.